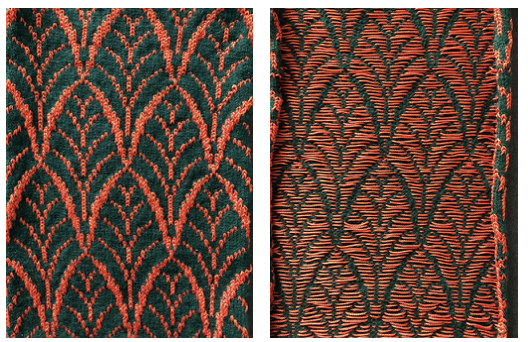 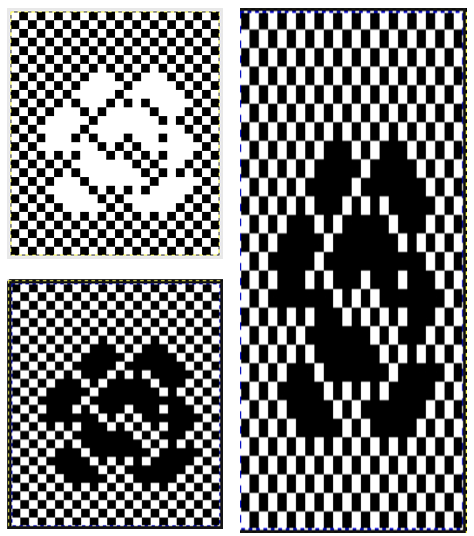 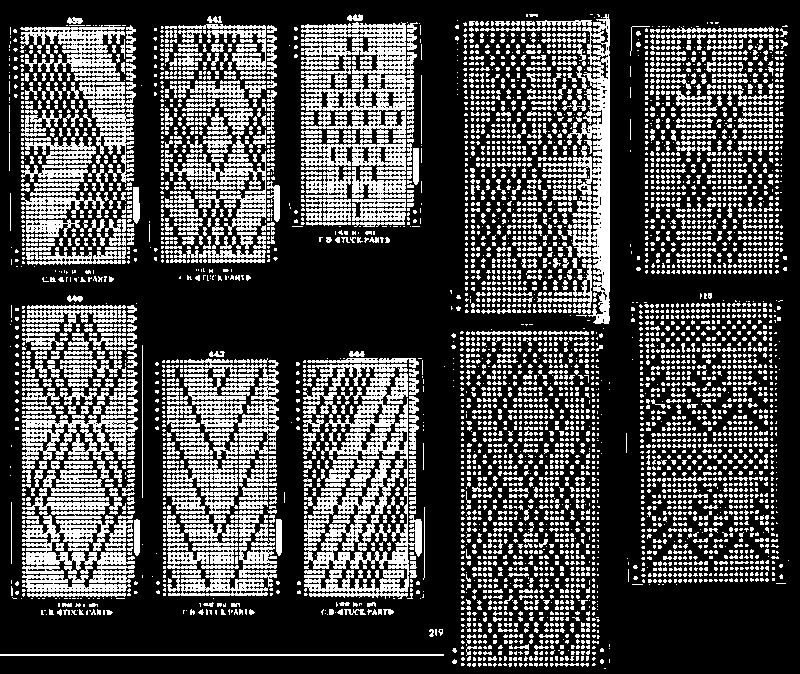 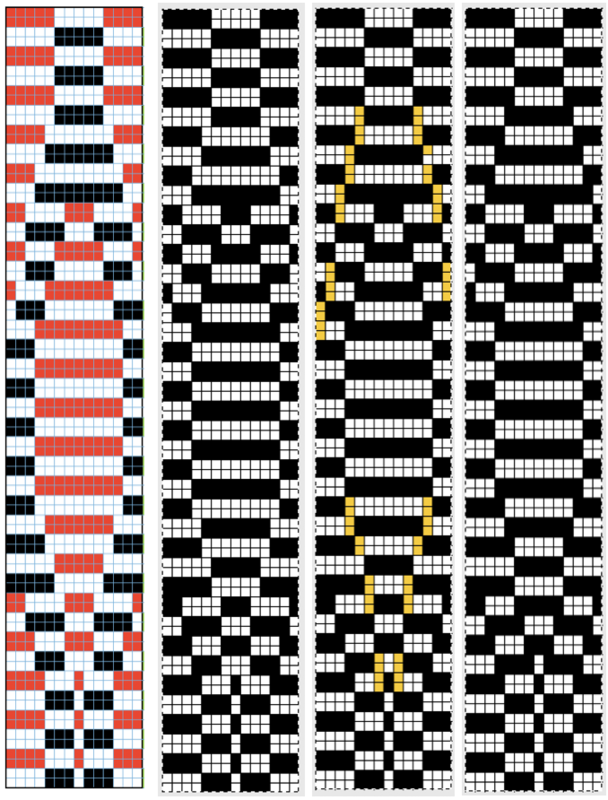 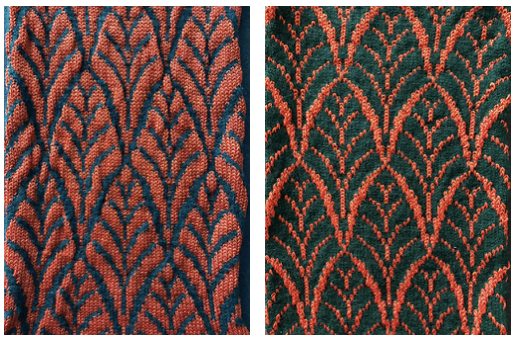 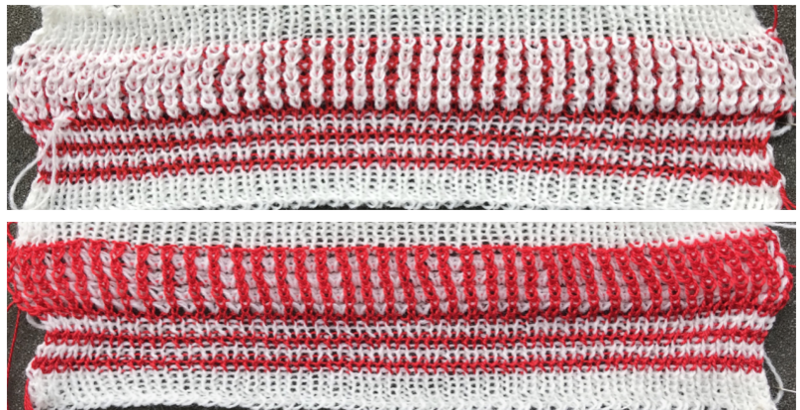 A full range of DBJ variations of the same repeat, including ones using slip stitch and shared in a previous post, executed in both one and 2 colors Passap knitters have the option of arrow keys and stitch type on the back bed that make fabrics possible with ease that are daunting to reproduce on Brother machines. 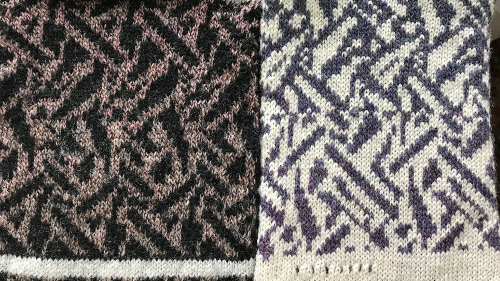 There is a category search on my blog that will lead to a collection of posts on the topic of knitting with 2 carriages selecting patterns. 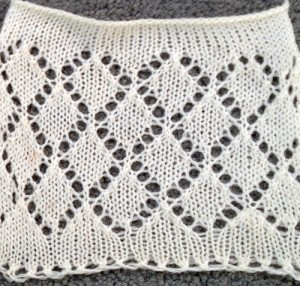 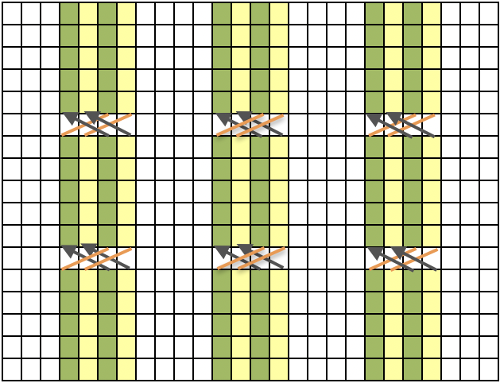 I have often considered the possibility of using 2 coupled knit and rib carriages for some of my patterns but found it limited knit width because of carriage stops on the ribber bed, the unwillingness to have my ribber carriages fly off the bed, and the added limitation imposed when both carriages are selecting needles. 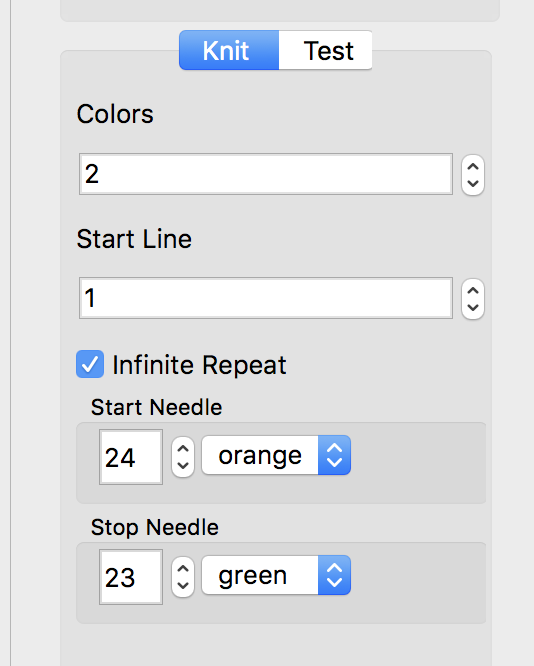 Now that setting changes were required every 2 rows on the ribber I found a solution of sorts. 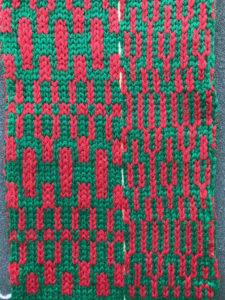 It is one of those try at your own risk tips, but for me it made several of the last swatches in brioche achievable far more quickly and accurately. 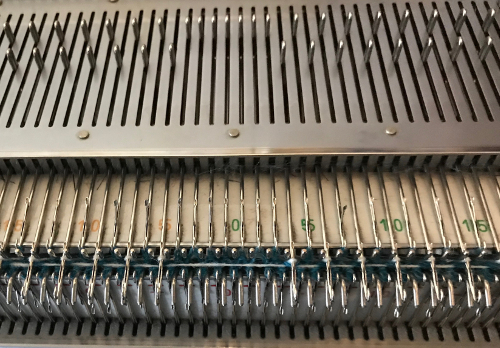 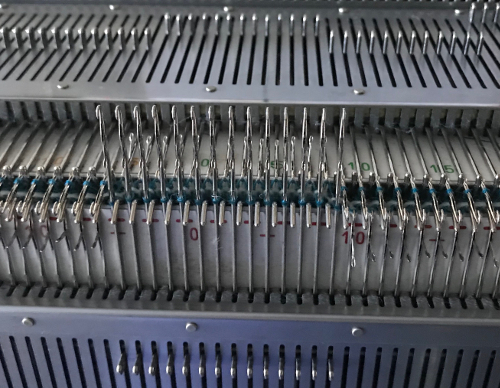 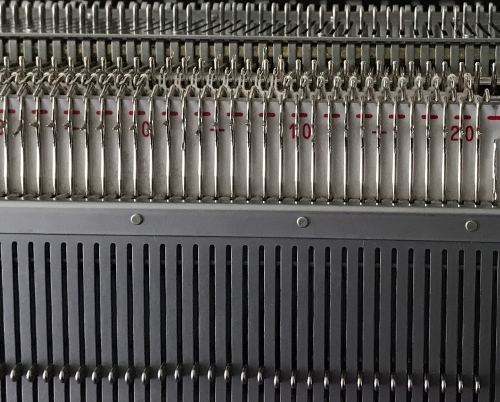 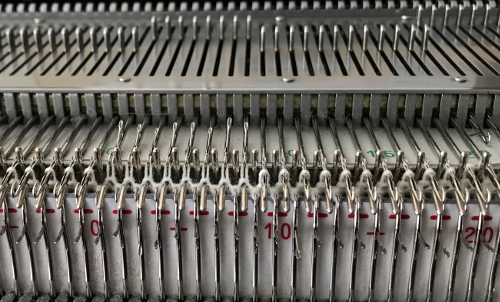 As in any knitting with pairs of carriages, when needle selection is happening from opposing sides, the turn marks need to be cleared on each side of the machine as the opposing carriage begins to move across the needle bed to avoid breaking the belt. 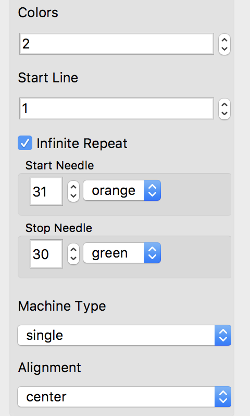 The right side of the machine is more problematic. 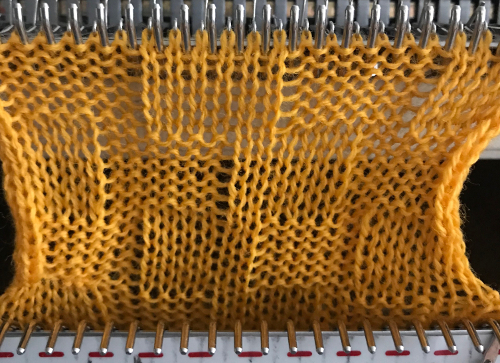 The extension rail will store the knit carriage safely, but the ribber carriage has to move out enough so without its stop it would fall to the floor. 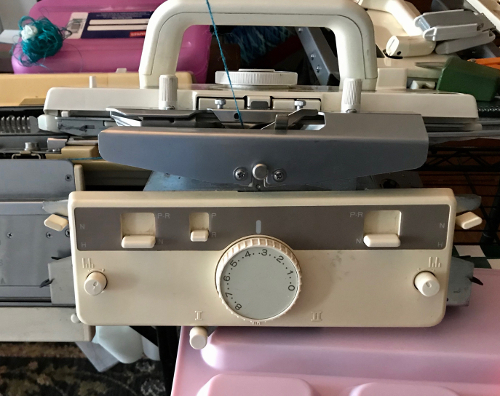 My solution was to jerri rig an extension the appropriate height so the ribber carriage could slide out as much as needed while being supported. 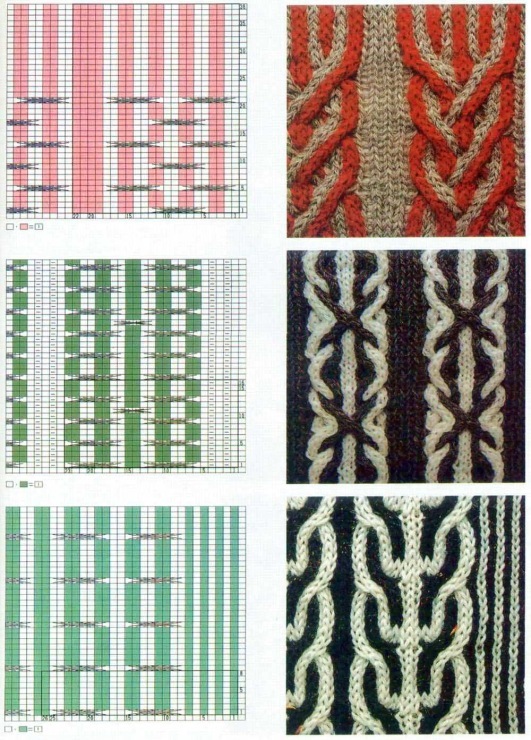 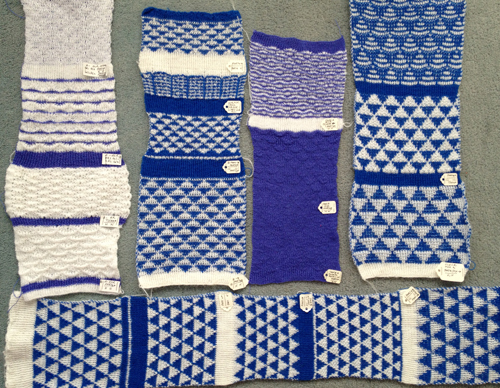 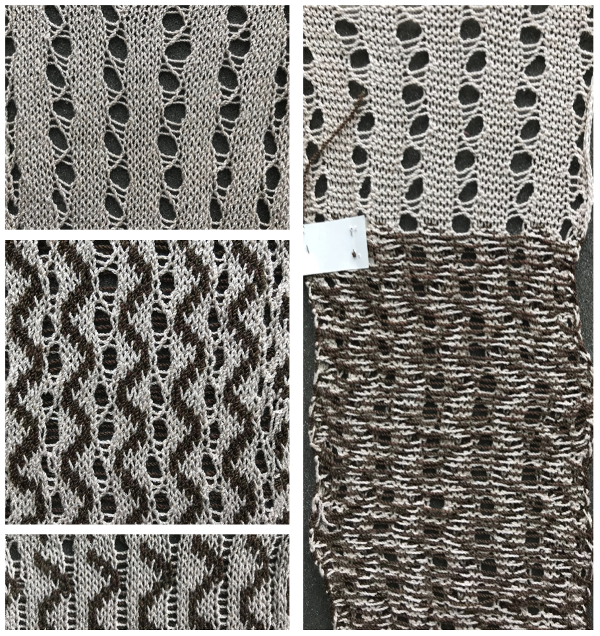 I was able to knit the hundreds of rows required for many swatches with no problem other than operator errors. 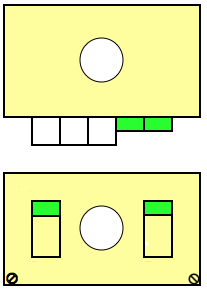 Here the pair of carriages on the right are seen resting far enough off the machine to clear the belt, at an adequate height for them to slide off and on easily. 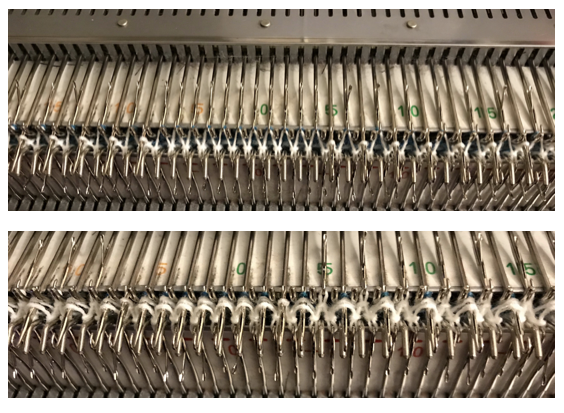 At first I secured the connecting arm to the connecting pin with an elastic “just in case”, but that proved unnecessary. 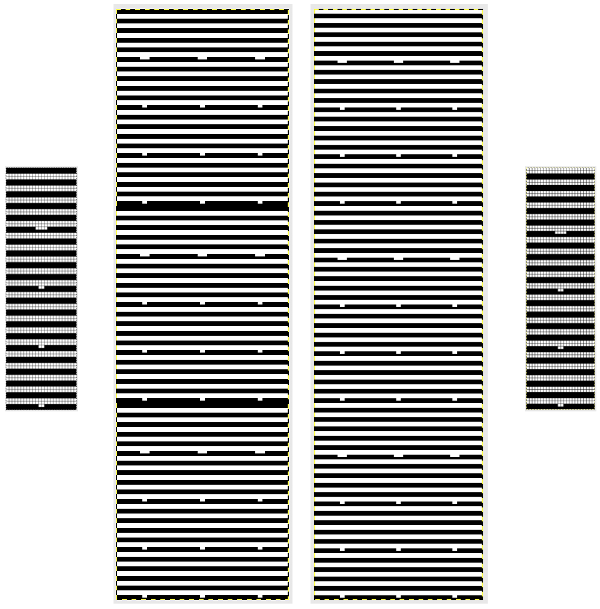 I have been asked lately about the lili setting used in all my ribber carriage illustrations (center position). 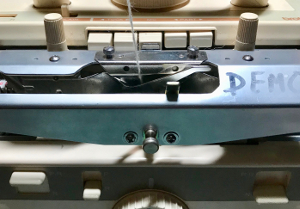 I tend to use that as a default to prevent errors and for consistent quality in my ribbed fabrics, especially if matching gauge ie in garment pieces or bands is needed. 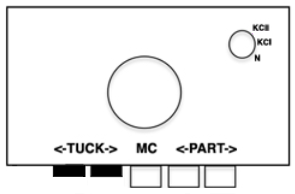 That said, for the carriage to travel far enough on the right in this set up, the slide lever had to be used on I. 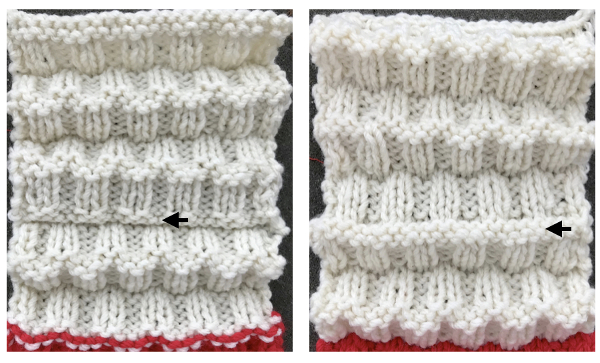 The plastic tray helped reach the appropriate height, and made for easy slide off and on. 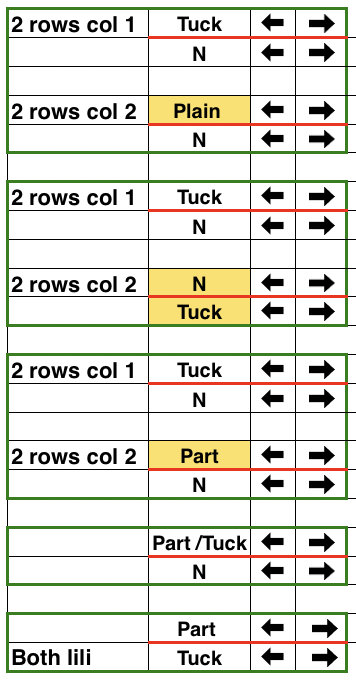 There are a few minutes of maneuvering when setting up first selection row. 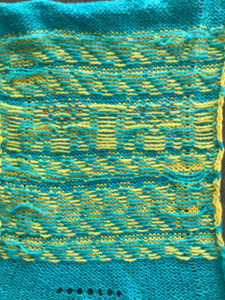 As always it is good to begin with familiar yarn and previous experience with double bed fabrics. 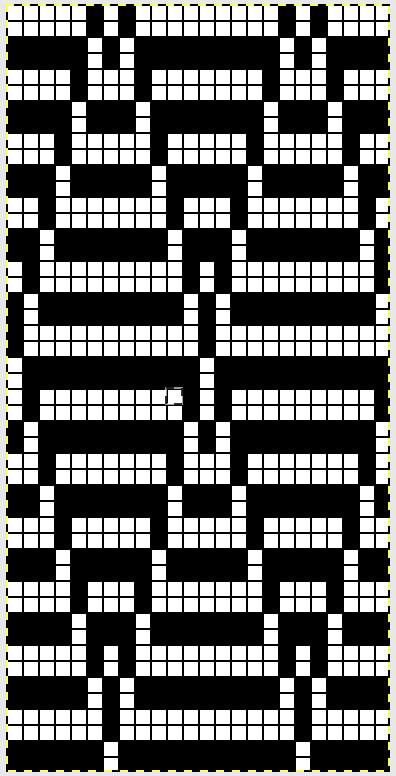 Some of my own operator errors are due to the fact that I still am not used to the fact that the 930 appears to revert to factory defaults with each new design entered, that I have to remember to switch from isolation to all over, that the image is reversed on the knit side like on punchcard machines unless the reverse key is used. 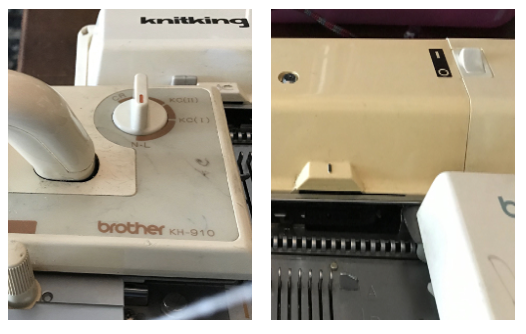 I spent decades using the 910, where once the selections were made and once the pattern variation buttons were set, that became the default until buttons were changed for specific applications. 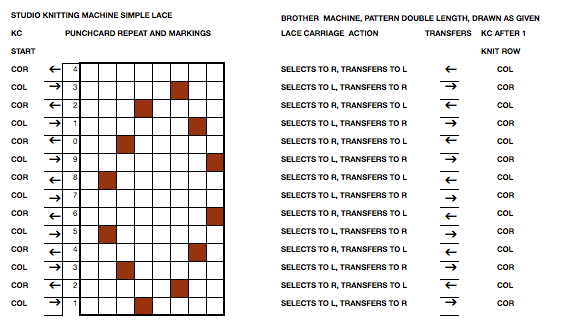 The 2 pairs of carriages may also be used for vertical striper backing using lili buttons on Brother machines, and for both slip and tuck variations of same. 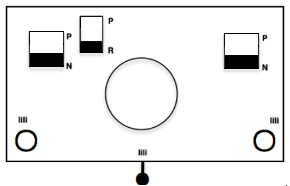 I will add information in a separate post. 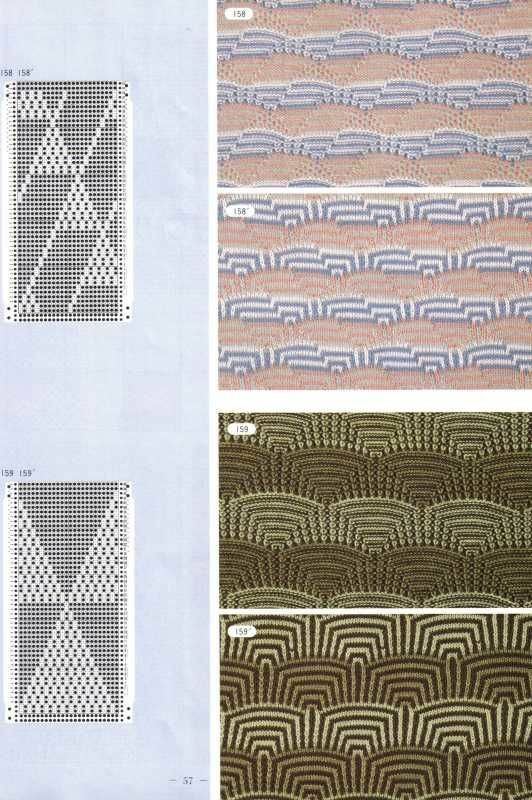 More “patterns” are possible as well, emulating some of the Passap possibilities for its back bed settings. 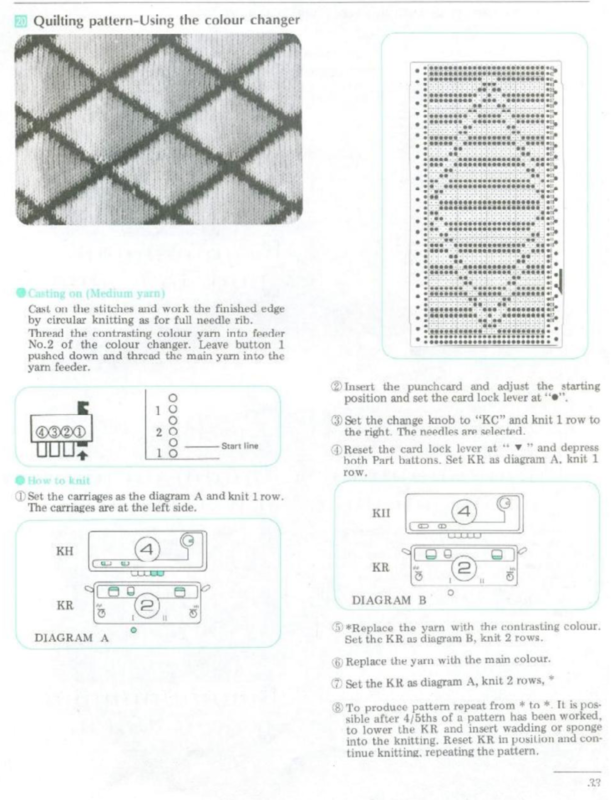 Many terms are used in instruction manuals and published directions. 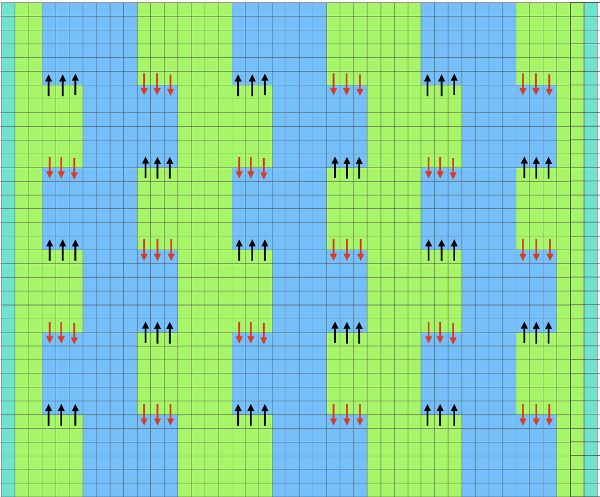 In my notes I will refer to fabric with tucking on both beds as full fisherman rib, tucking on one bed only as half fisherman. 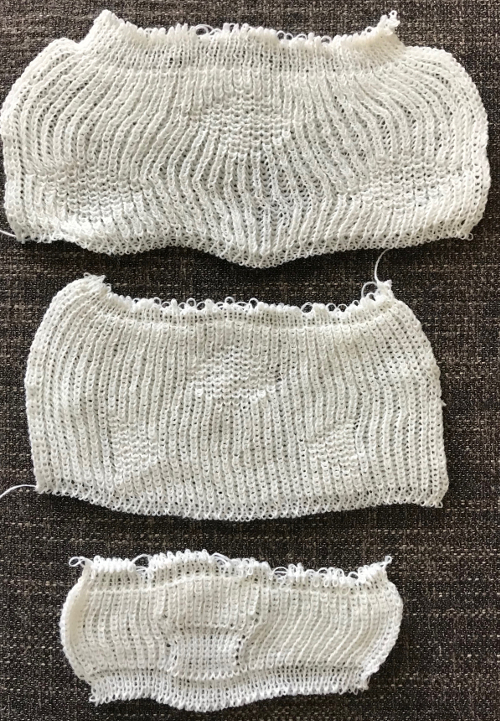 These were my first attempts at exploring the inspiration idea, the fabric has inherent differences as it requires both slip and tuck stitch settings, so technically it is neither fisherman. 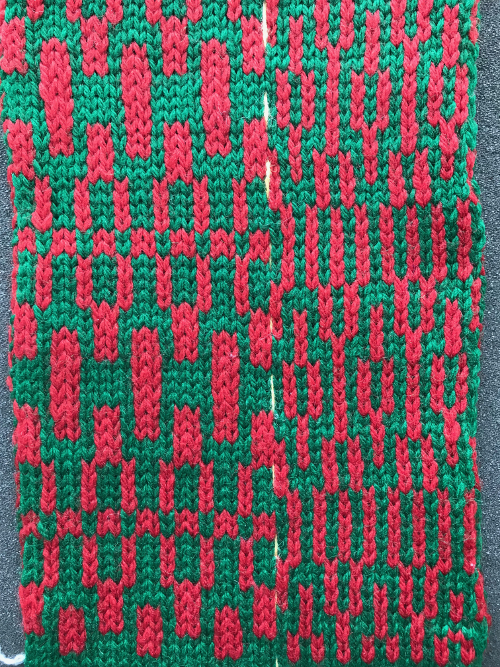 Knitting happened on a random drop stitch day, which explains the patterning interruption errors. 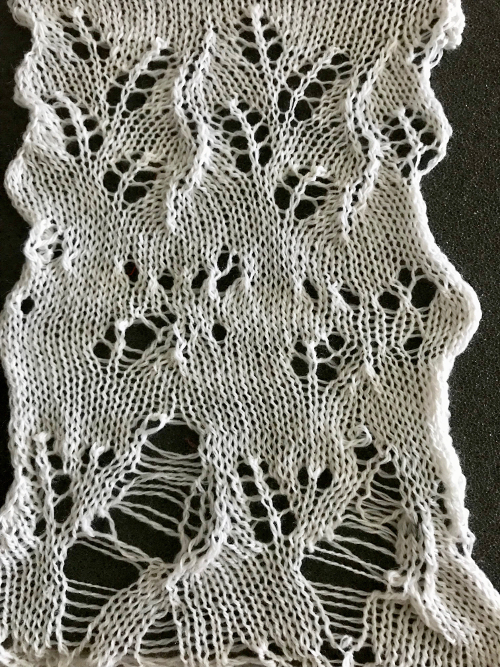 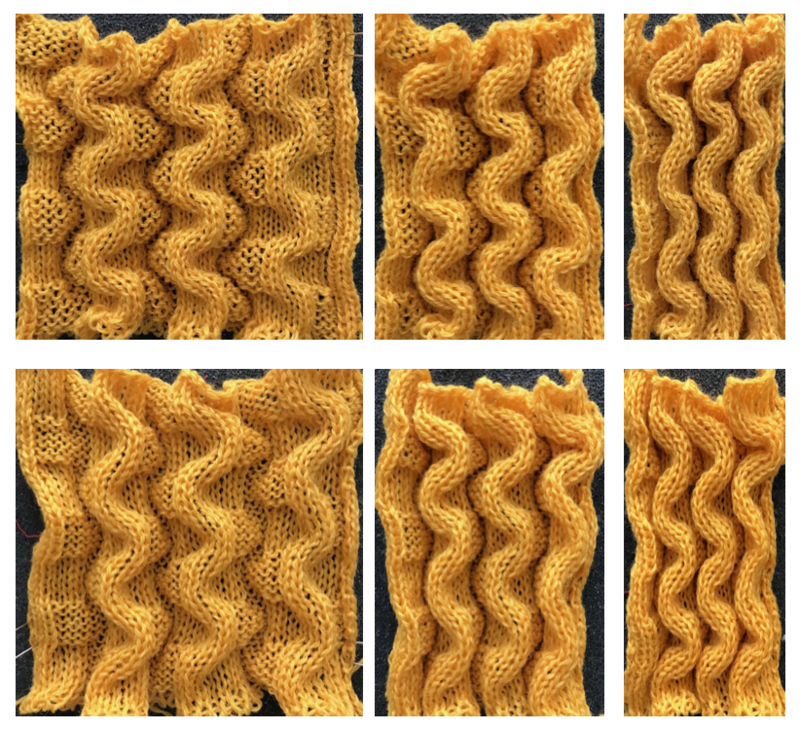 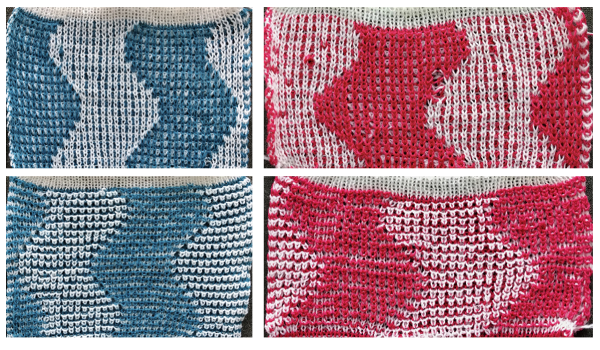 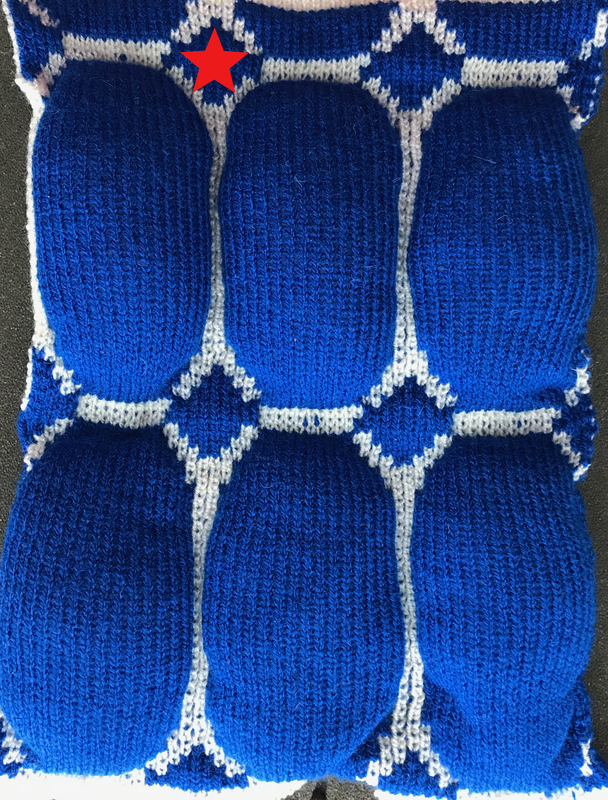 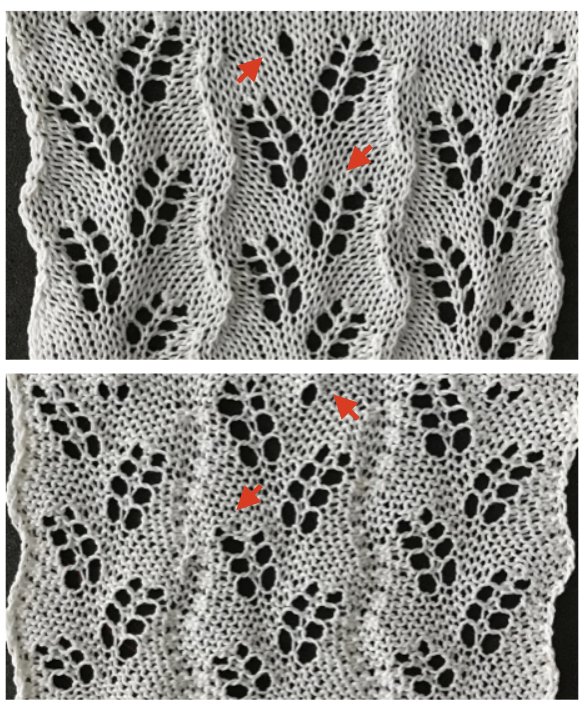 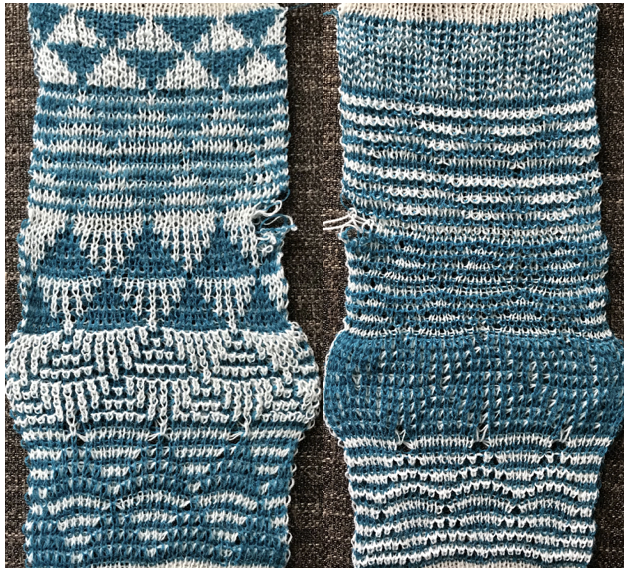 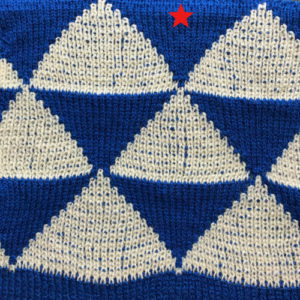 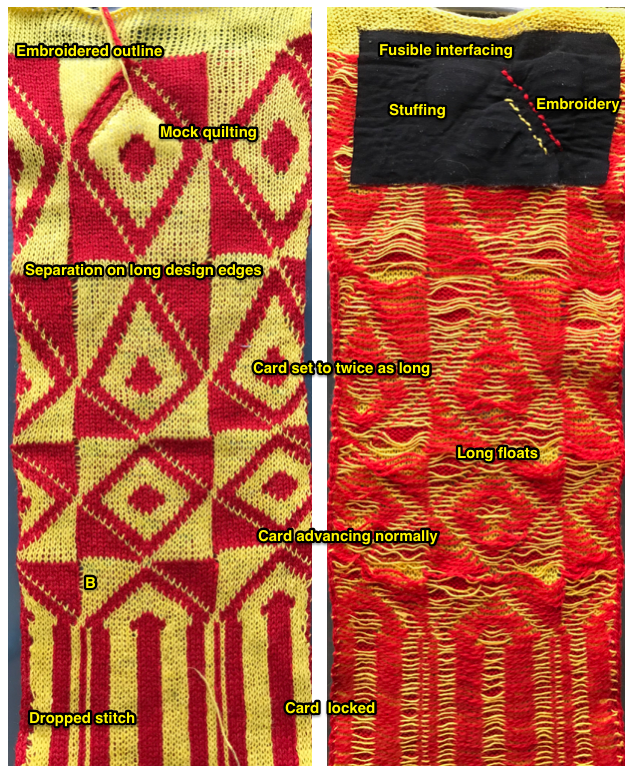 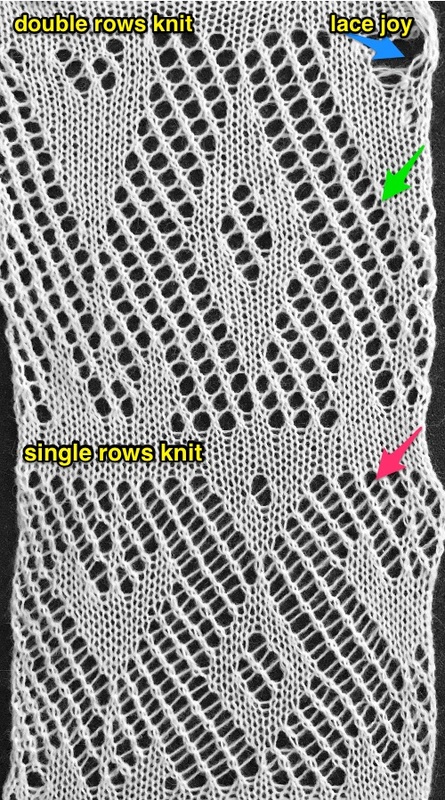 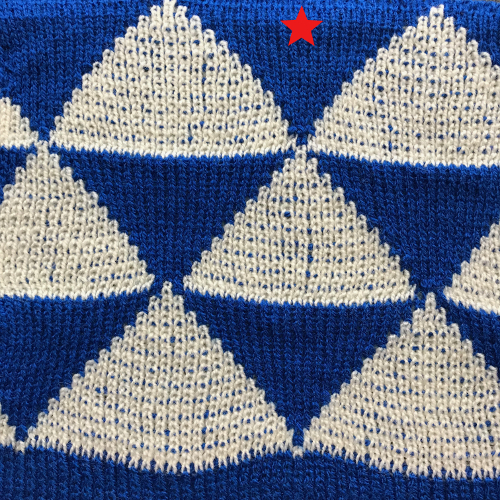 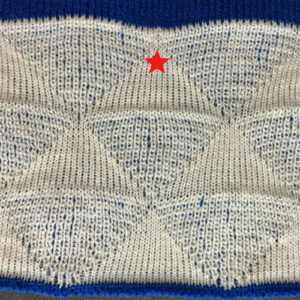 When attempting to knit isolated geometric areas on a field of frequently tucking stitches, automating the task when possible makes the process easier and faster. 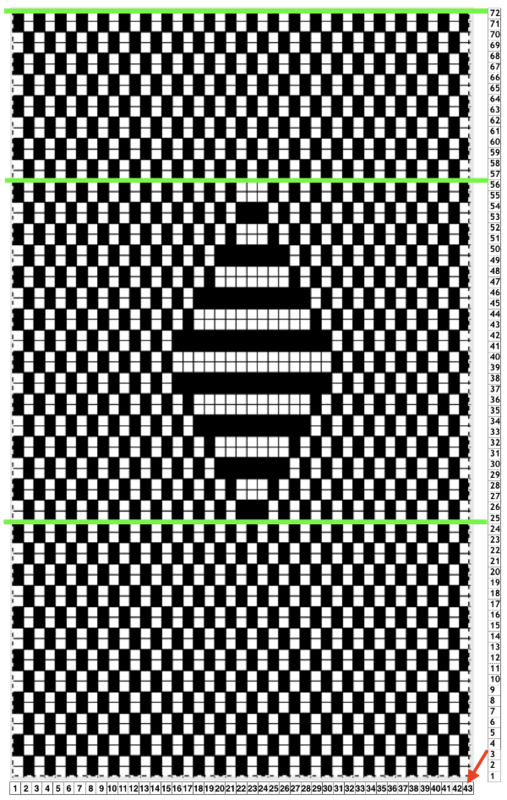 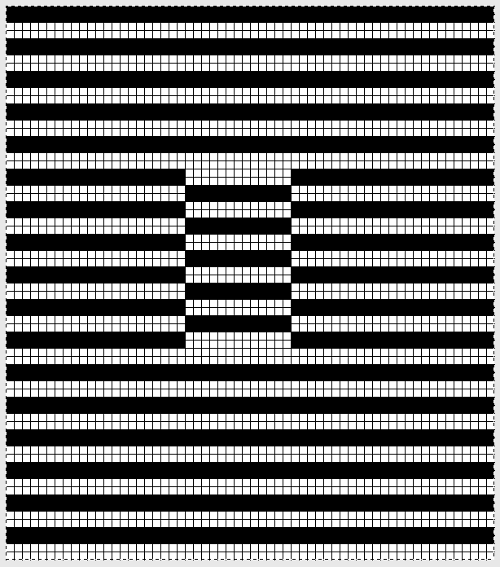 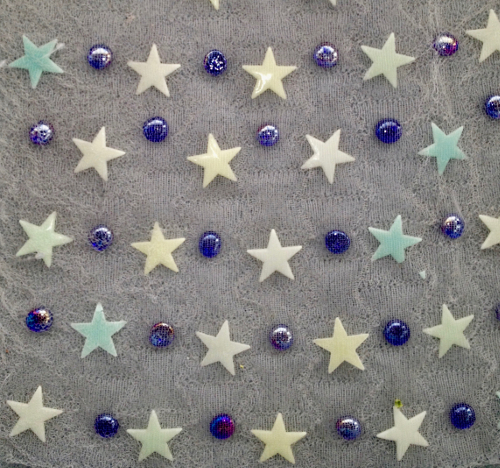 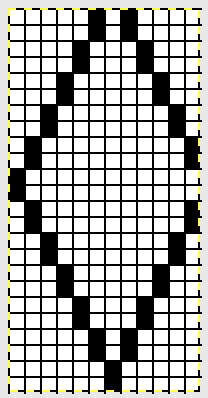 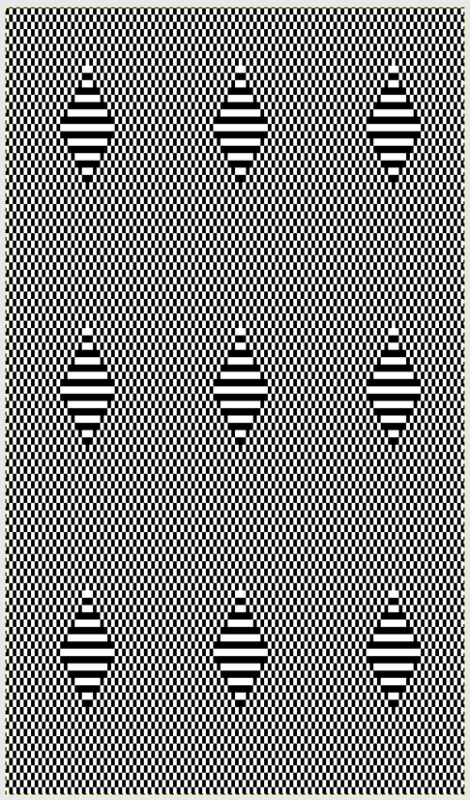 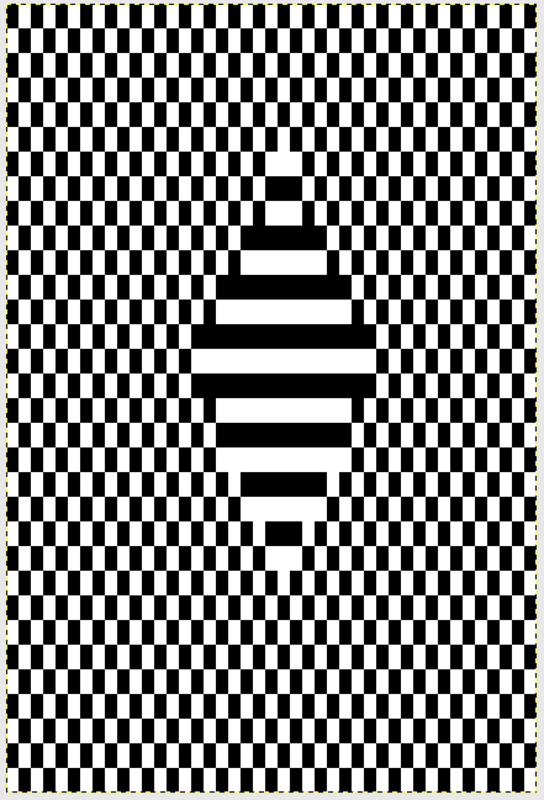 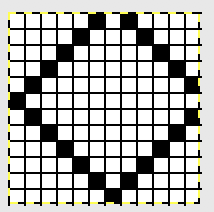 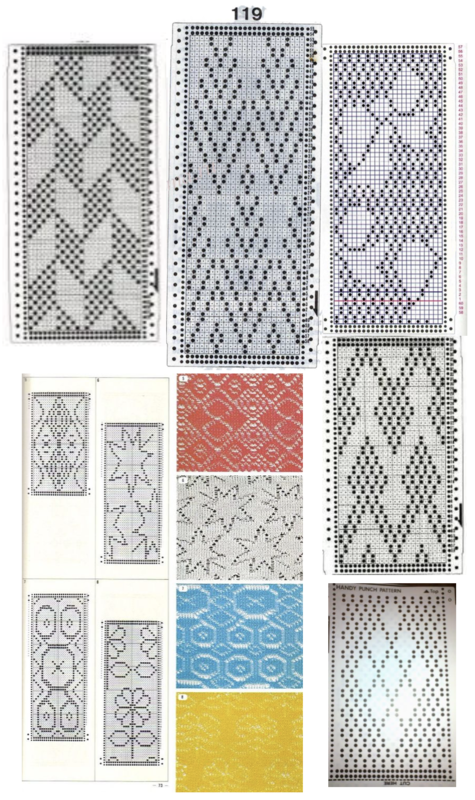 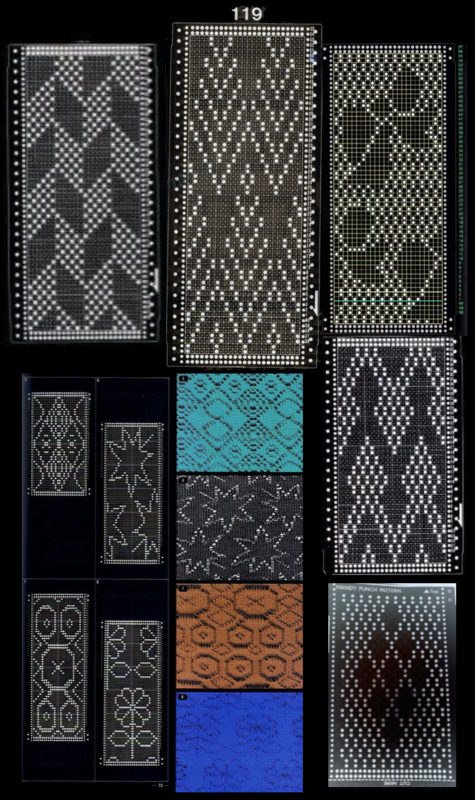 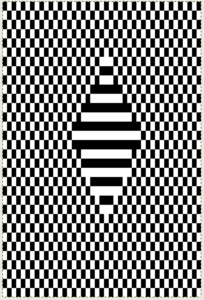 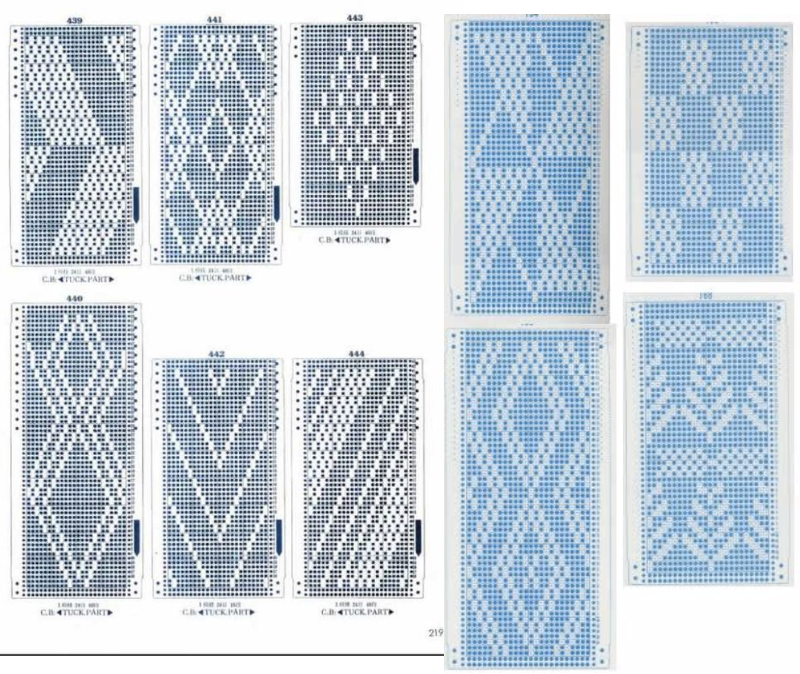 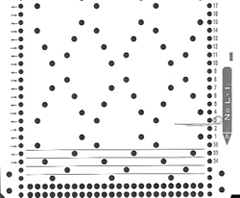 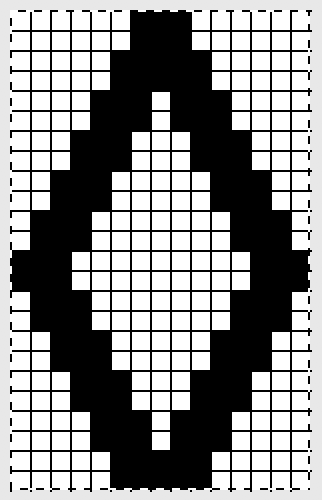 This was my first “diamond” pattern repeat, suitable for a punchcard machine as well. 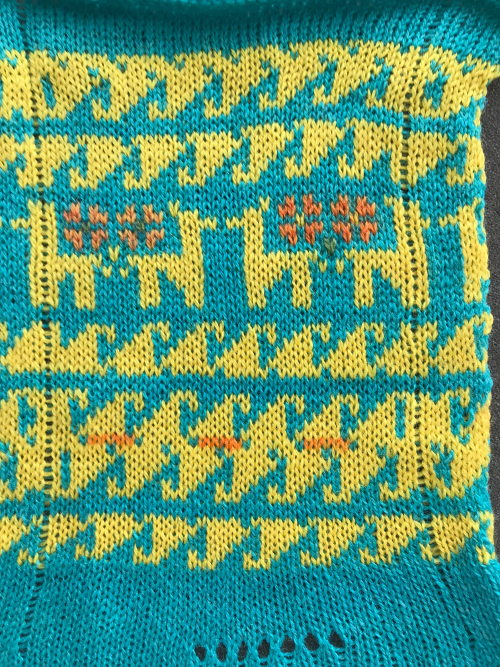 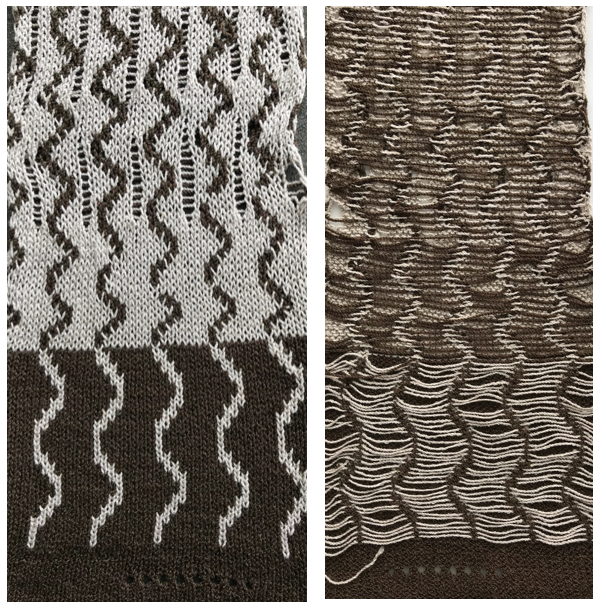 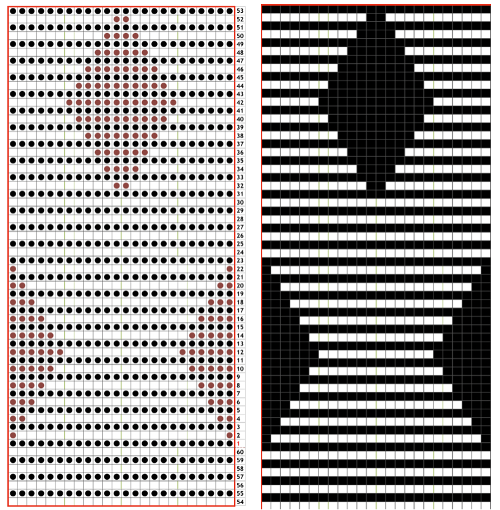 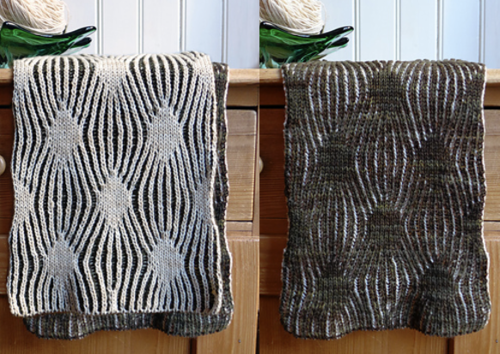 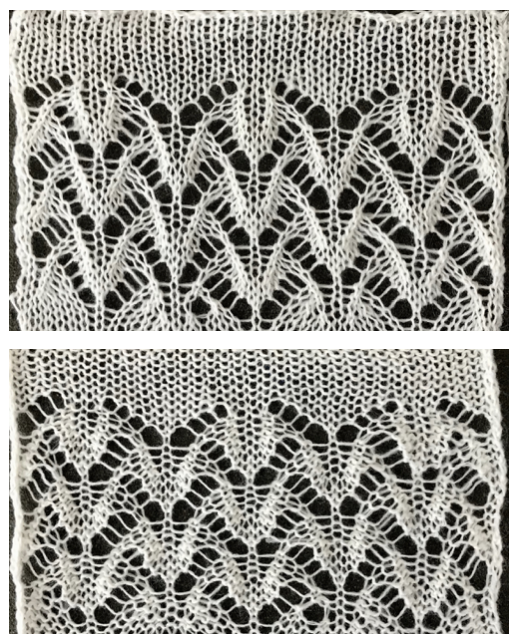 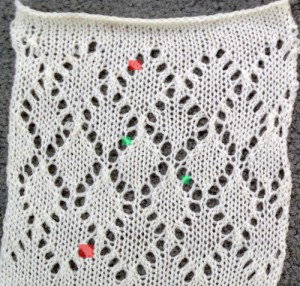 The design is illustrated on the left, converted to punched holes/black squares/pixels on the right The knit carriage is set to tuck throughout. 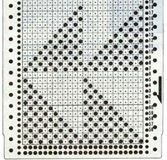 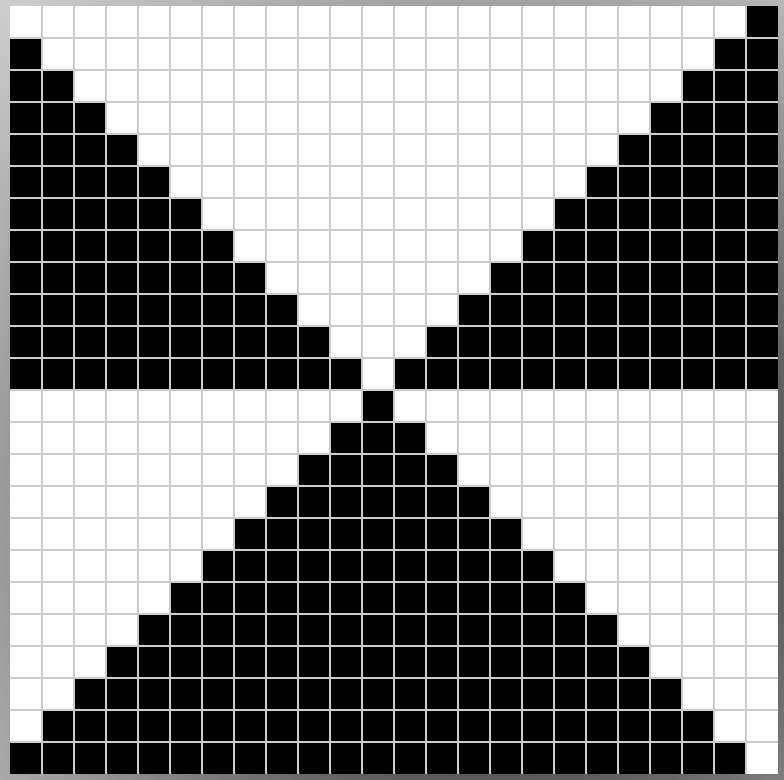 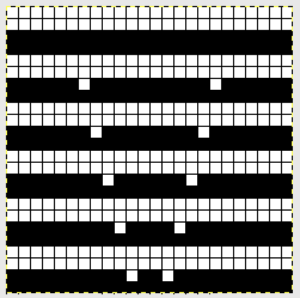 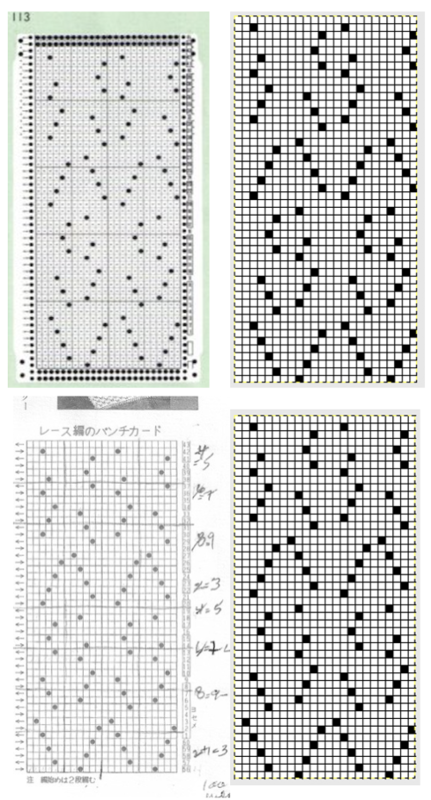 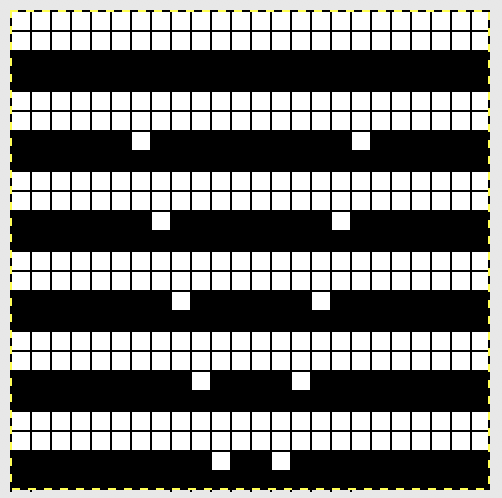 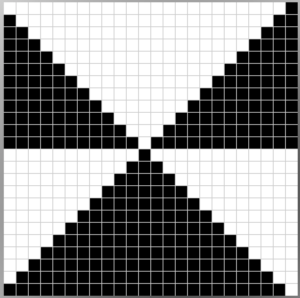 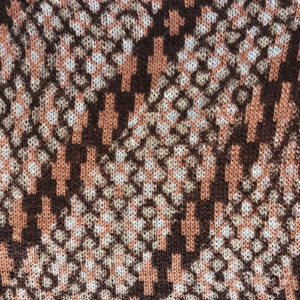 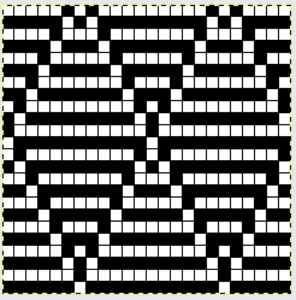 The programmed repeat will alternate the knit/ tuck functions across the bed based on black squares, punched holes, or pixels. 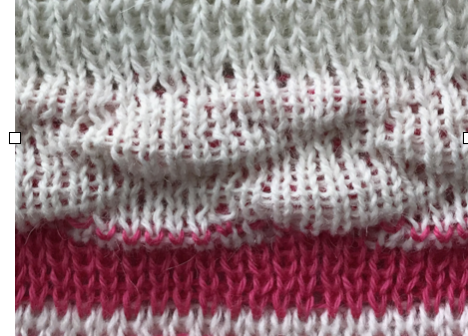 For full fisherman rib (top swatch) the ribber needs to tuck in one direction only, opposite to the action taking place on the main bed. 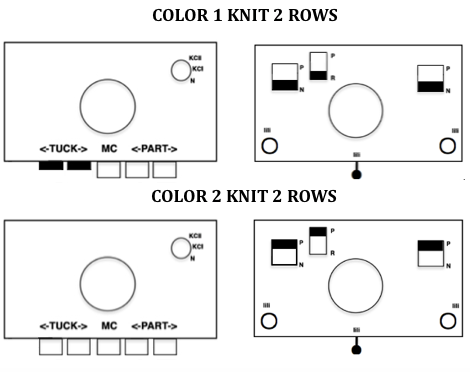 A choice needs to be made on either of these 2 setting directions based on needle selection on the main bed, and stays fixed throughout knitting. 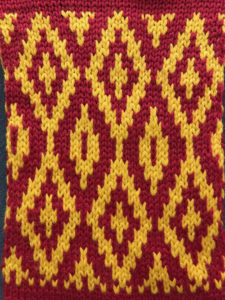 The ribber is set to knit on even numbered design rows on the card, to tuck on odd. 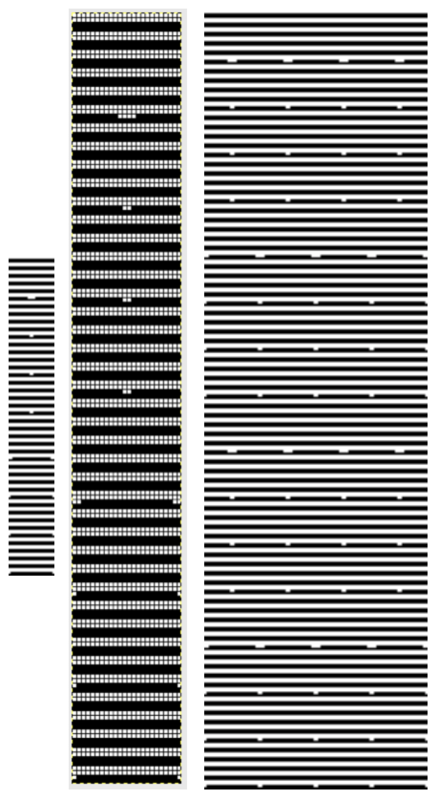 Row count numbers may be different than design row ones depending on row counter settings by the operator or built KM ones. 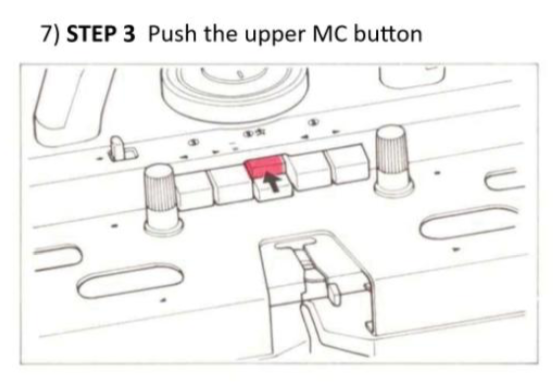 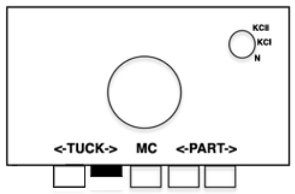 Below are tuck settings for to the right on top, to the left on the bottom. 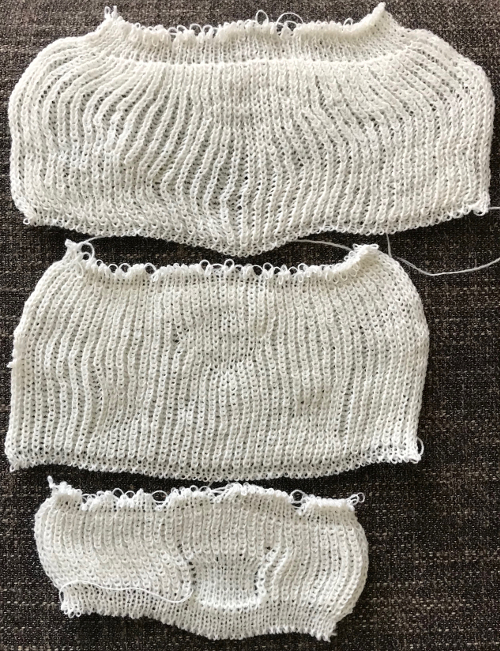 For half fisherman rib (middle swatch), the ribber is set to knit with every pass. 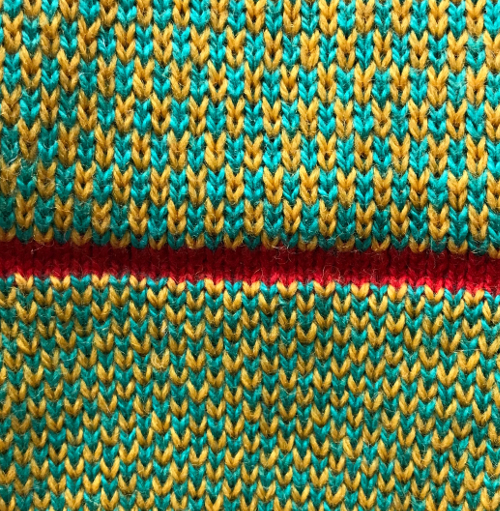 Note the half fisherman fabric is narrower than the full. 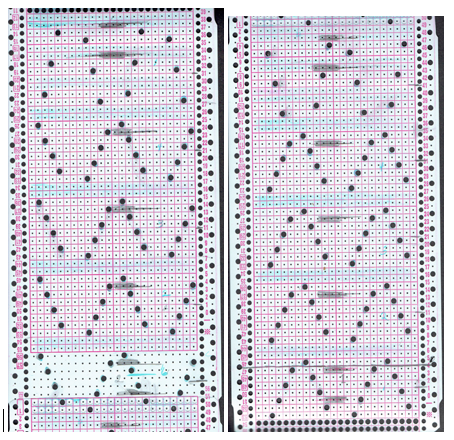 Also, I am not used to my 930, overlooked that the machine was set for isolation, so its bottom diamond shaped repeats are incomplete. 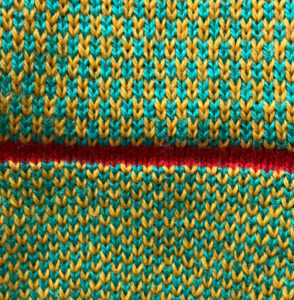 In the bottom swatch I tried to produce a more distinct shape on tubular tuck created with only knit stitches on both sides of the fabric. 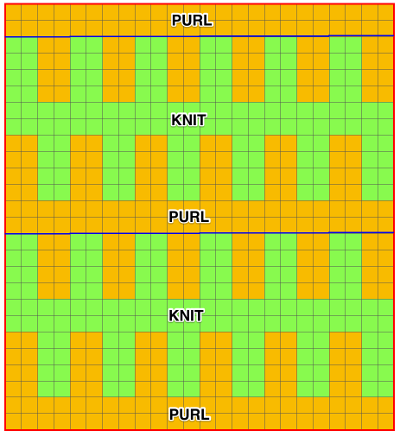 Hand selection on the alternate beds on all tuck rows produced knit stitches in the desired area. 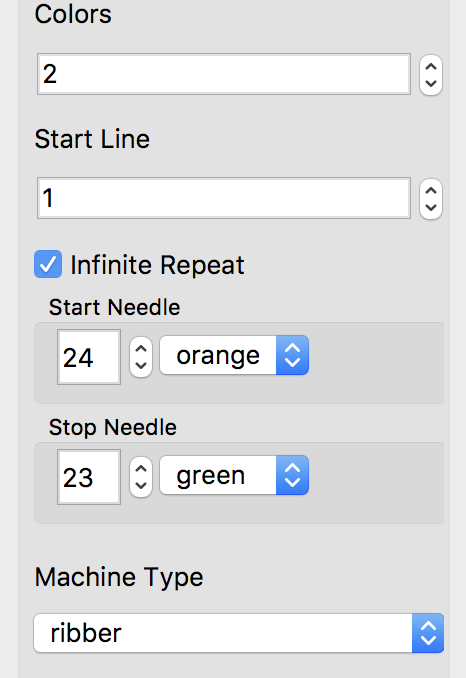 A needle out of work made it easy for me to find proper location on needle bed . 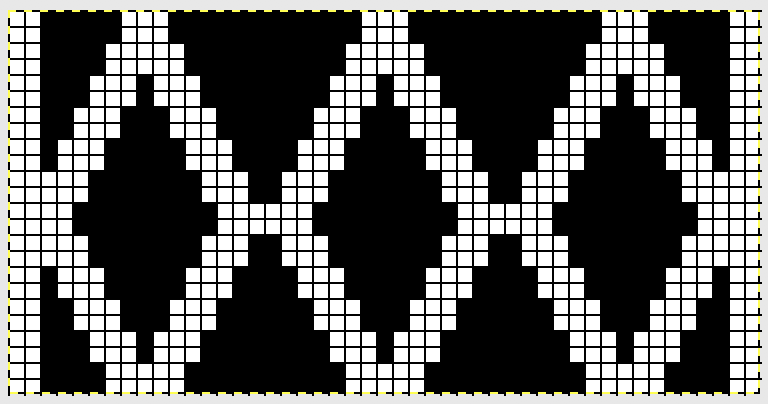 Getting back to automating at least part of the process for such shapes: the repeat needs to be altered The main bed will be knitting the black squares in the chart on the right on every row, tucking the white ones. 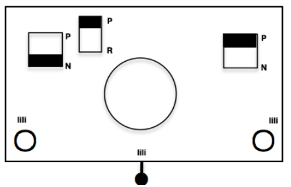 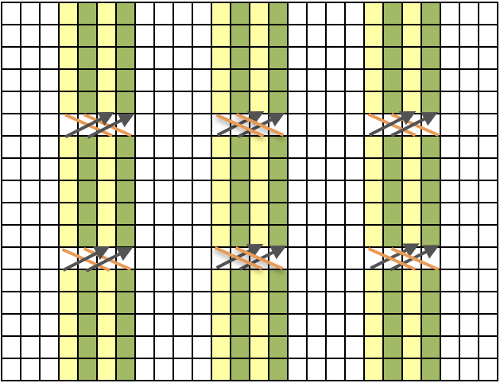 When the ribber carriage is on the side appropriate for it to tuck the following row and no needles are selected in design segments on the top bed (odd numbered design rows, ones with majority of black squares, tuck <— —> may not be used in those locations because then the resulting stitches would be tucking on both beds with nothing holding the tuck loops down. 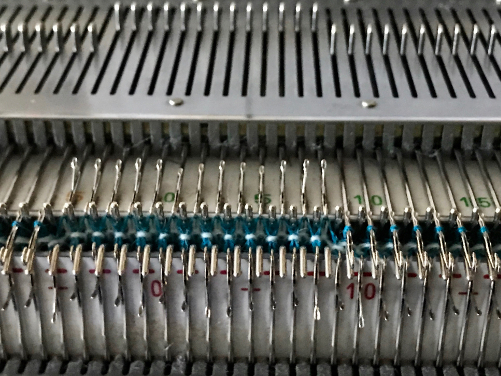 bring all needles between selected main bed needles up to hold on the ribber so that they will knit while the remaining needles tuck on the next pass of the carriages. 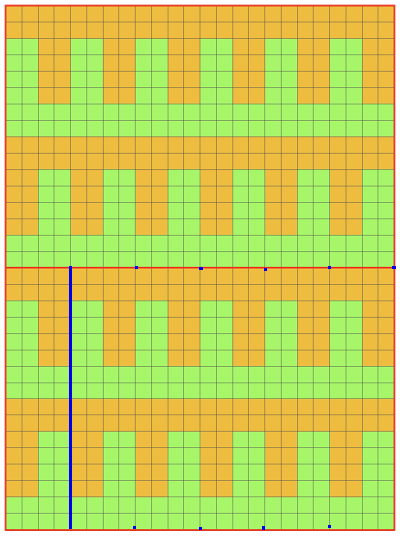 In my sampling the ribber was set to tuck when moving from right to left. 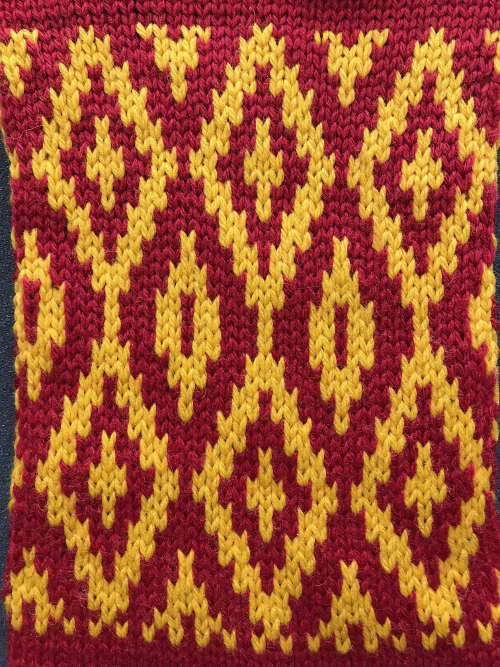 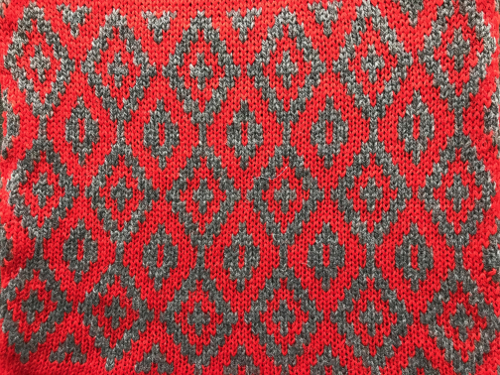 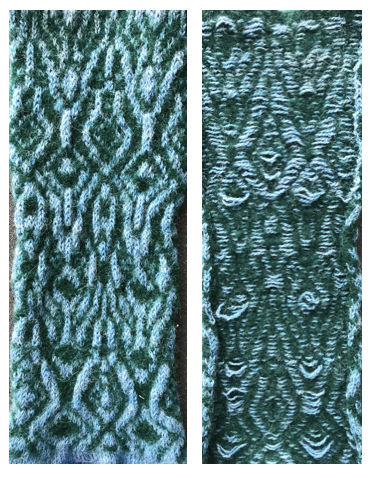 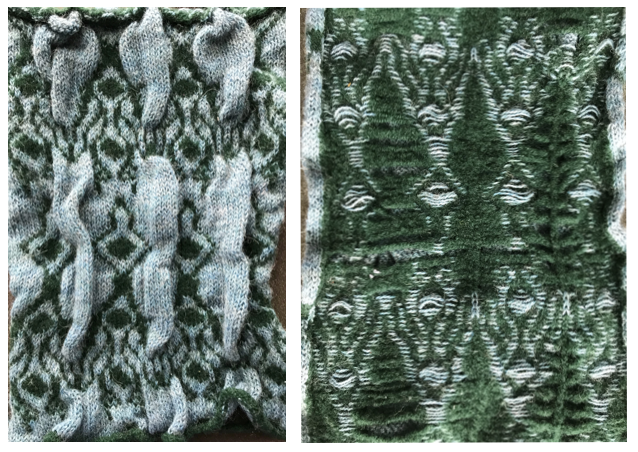 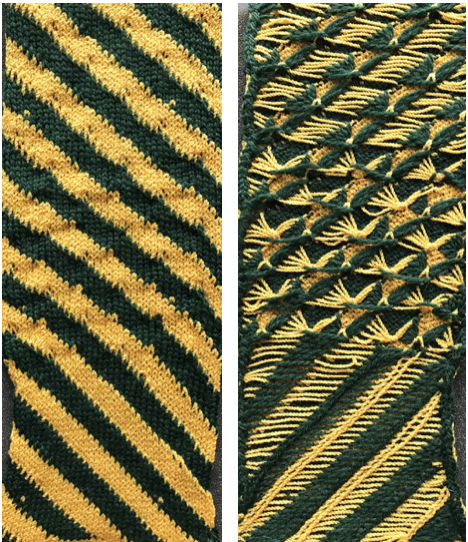 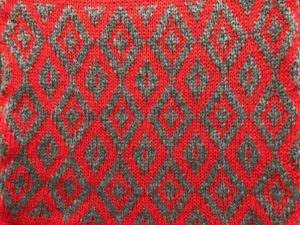 Below is the resulting swatch, shown on both sides. 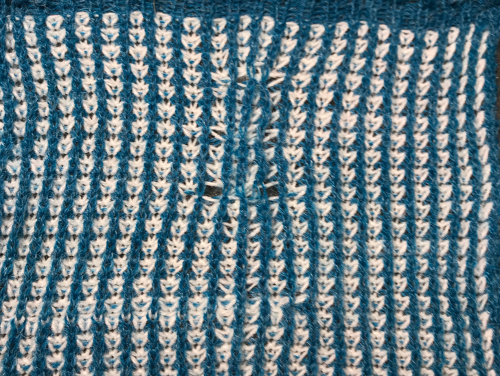 Part of one diamond shape is missing due to the fact I was concentrating on moving needles around and missed the change in selection on one side of the machine. 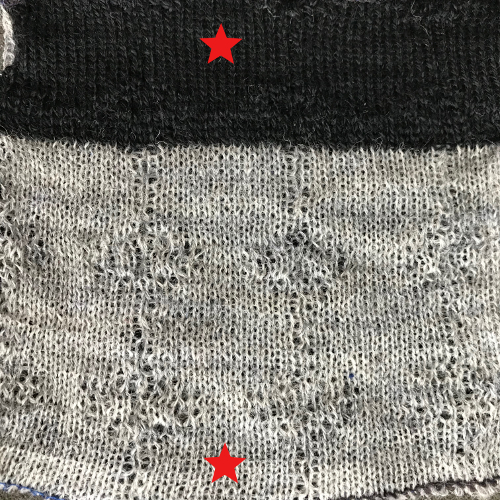 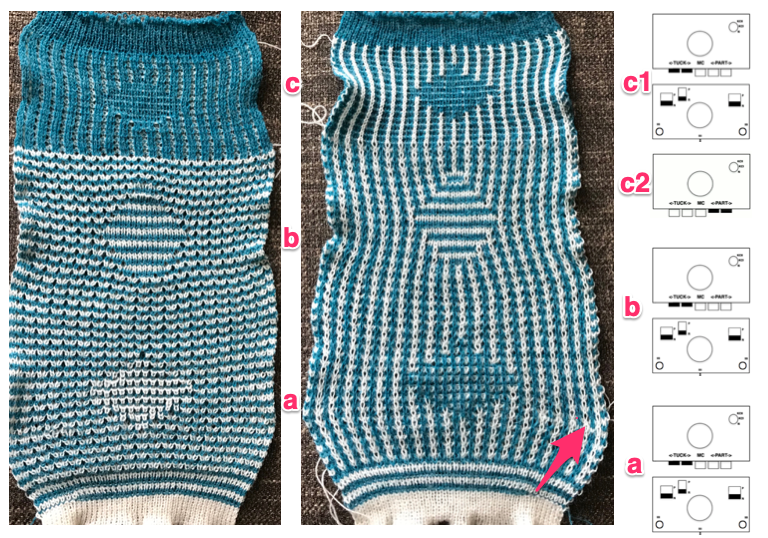 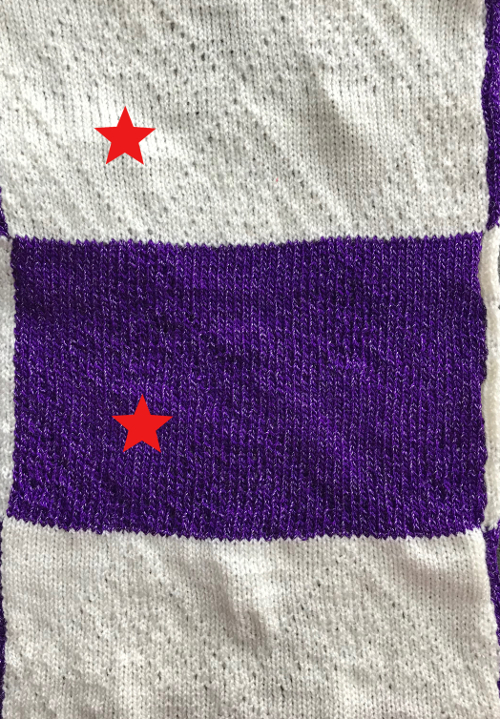 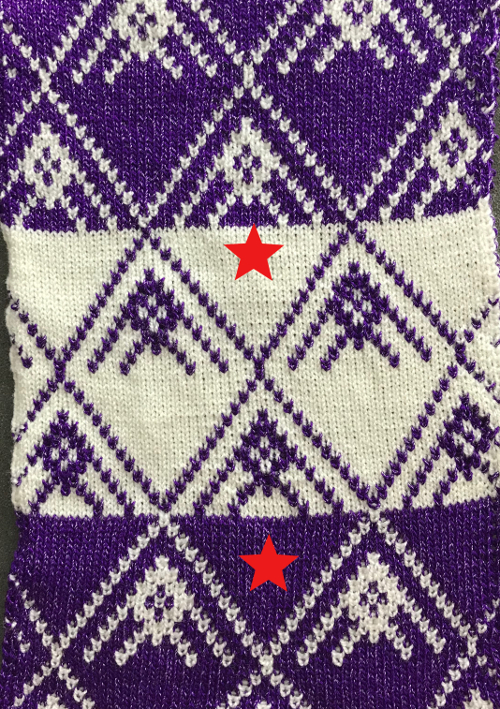 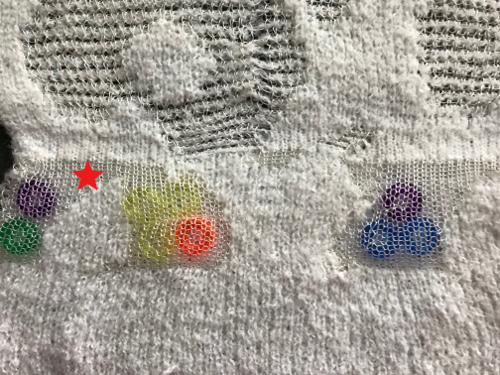 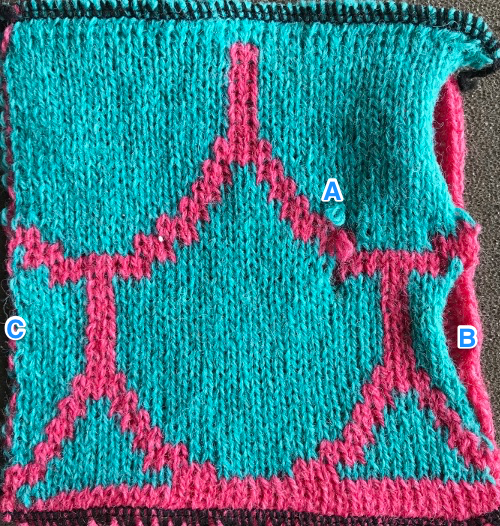 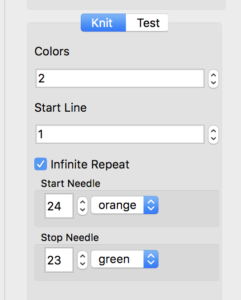 Back to the original the method used in the previous post where ribber settings are changed from knit to tuck <– –> every 2 rows along with color changes. 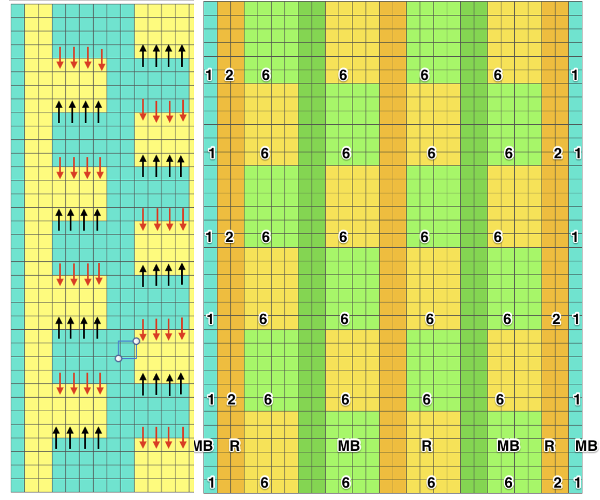 I chose a design that would make it easy to identify location of non selected needles on the main bed on rows where ribber will be set to tuck in both directions. 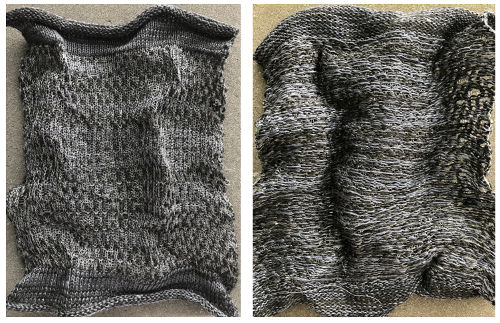 The result is interesting, but the “solid” areas, narrower than the remaining knit, are in the opposite color to the dominant one on each side, the reverse of the inspiration fabric. 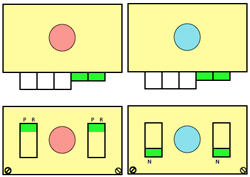 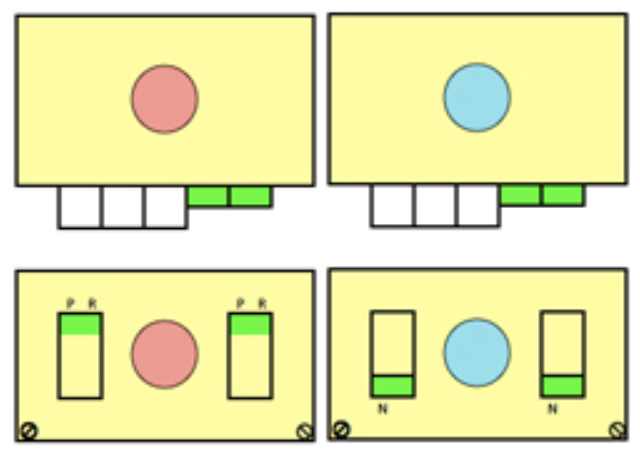 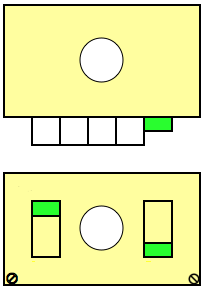 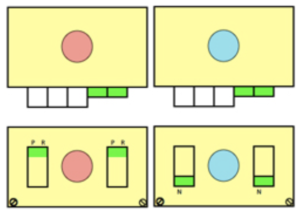 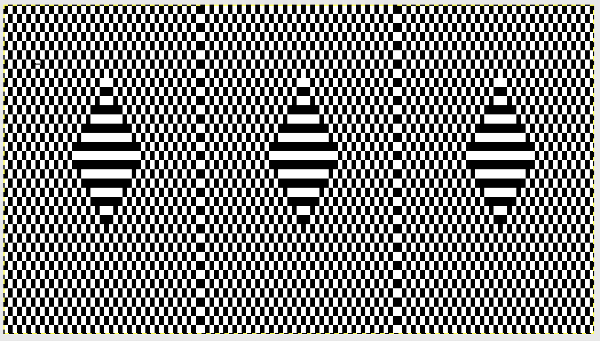 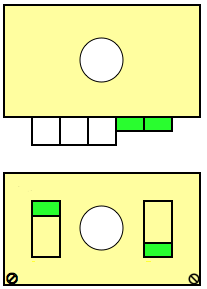 Analyzing the result in section C: the diamond is the same color on both sides, whereas the initial rectangular shape experiment reverses the colors. 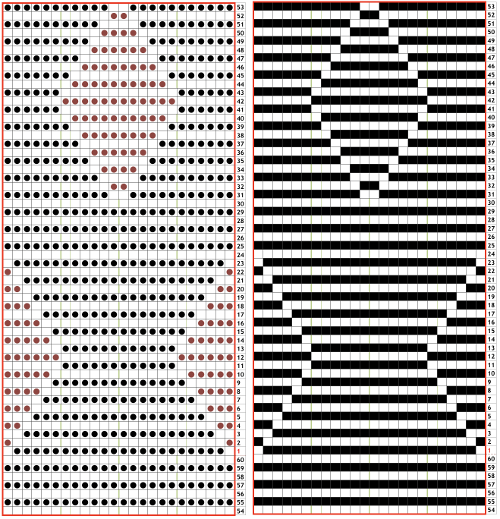 Reworking the diamond repeat in segments that are each a multiple of 4 rows: Other considerations in DIY designs. 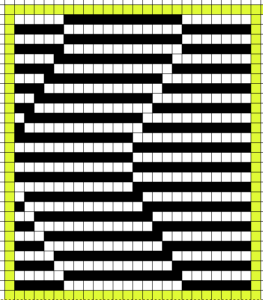 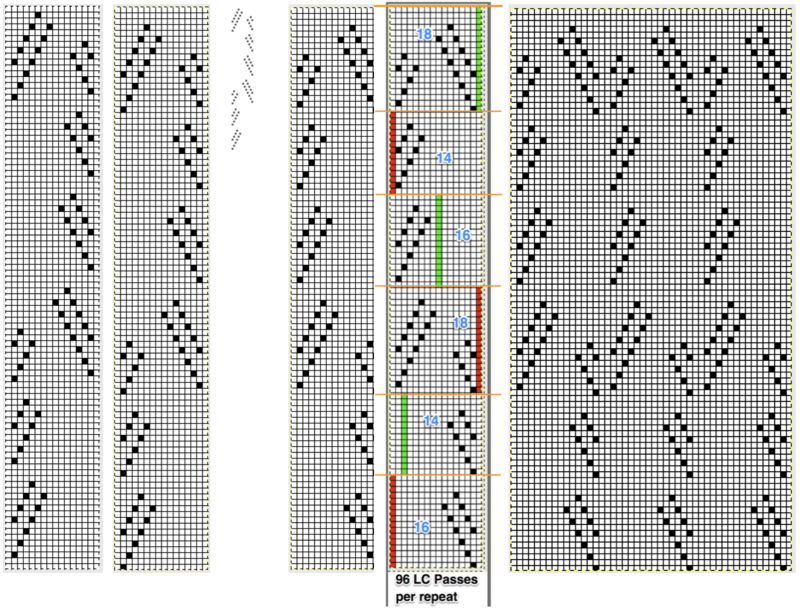 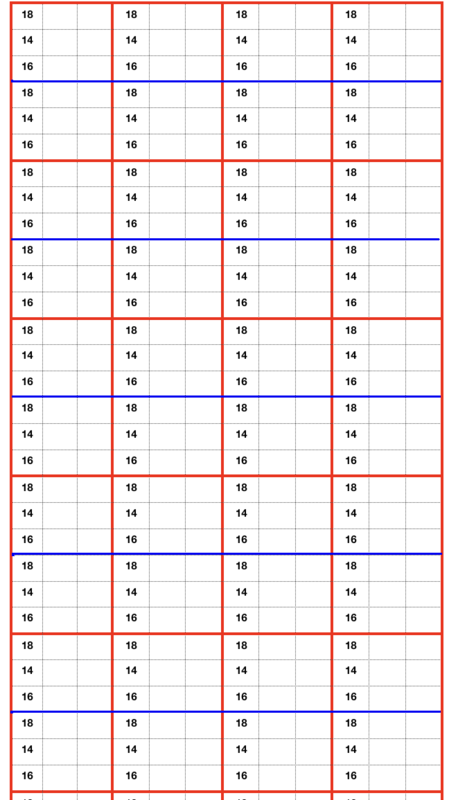 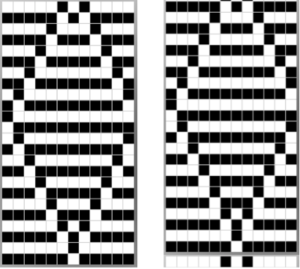 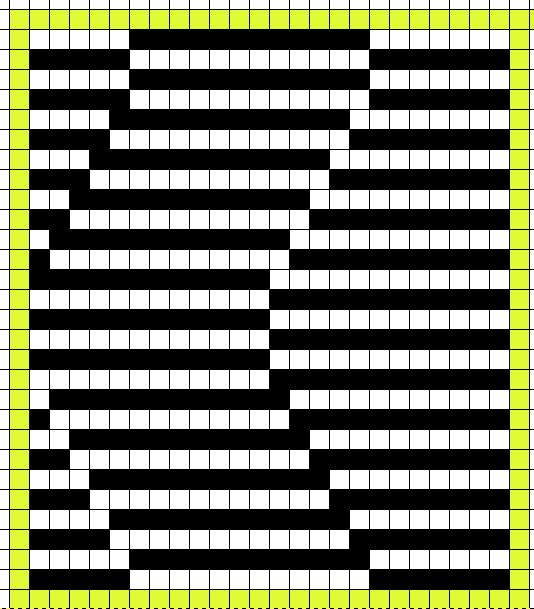 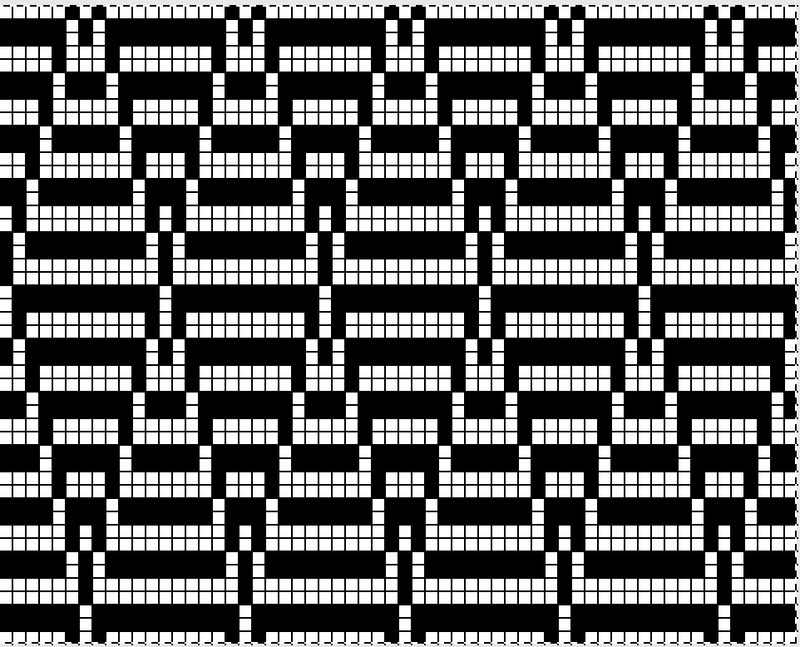 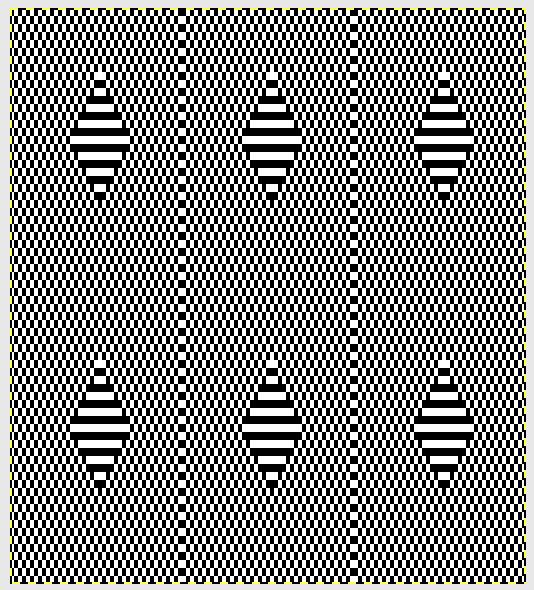 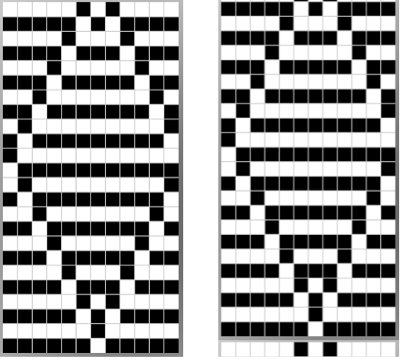 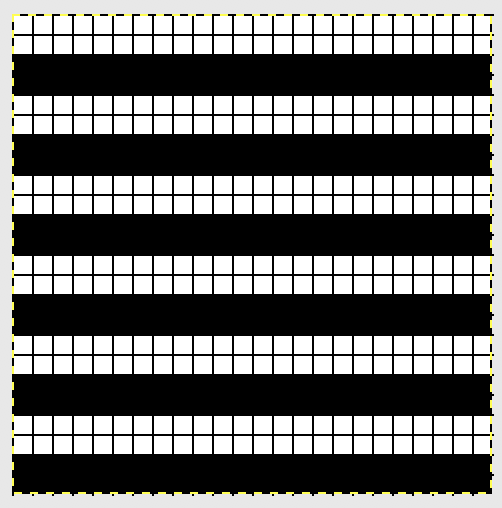 The background repeat for this pattern is actually composed of units 2 wide by 4 rows high. 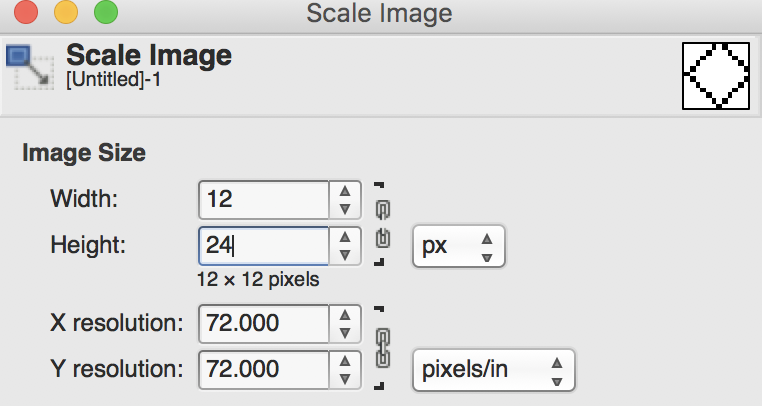 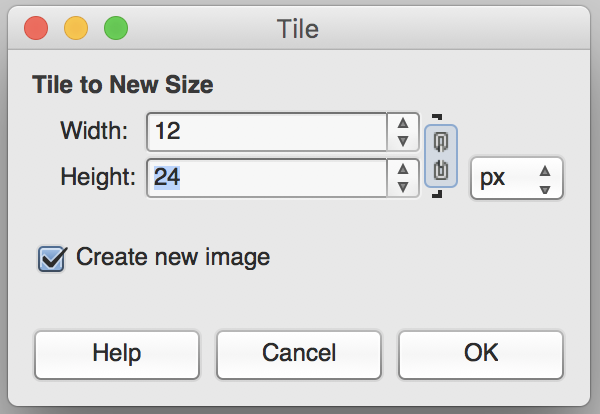 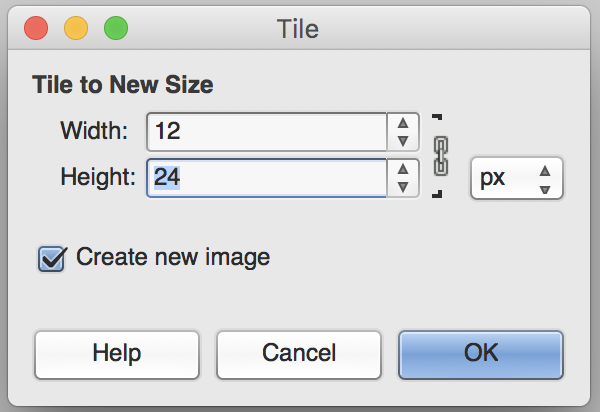 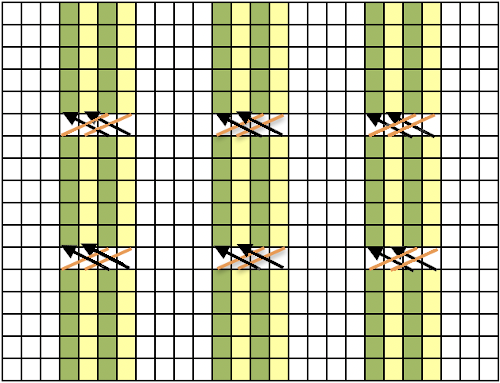 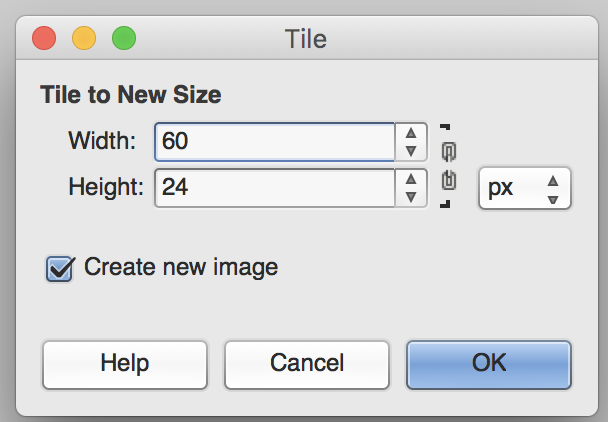 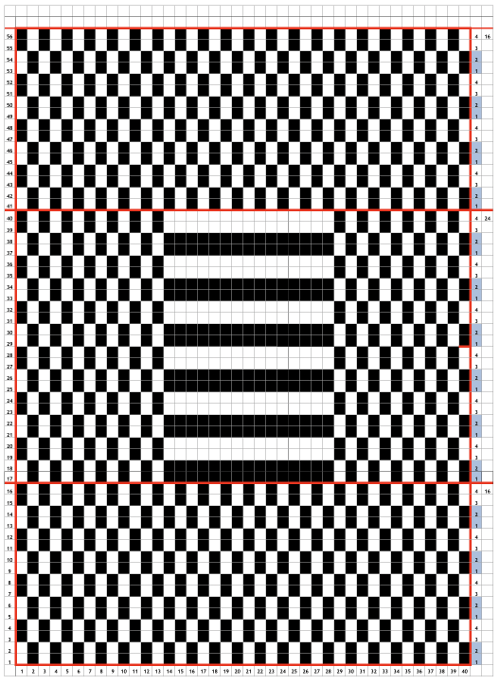 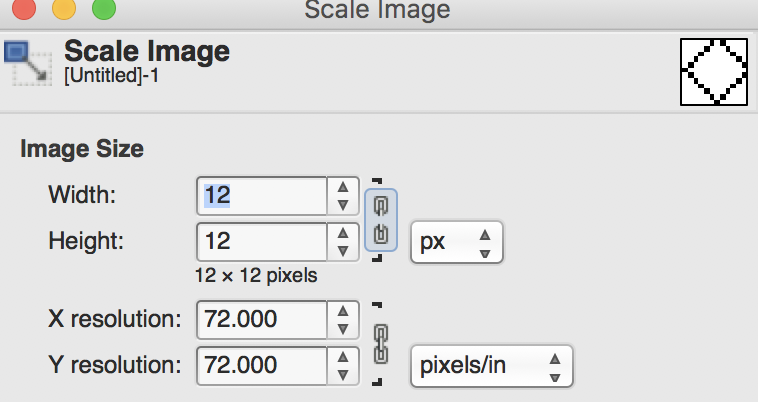 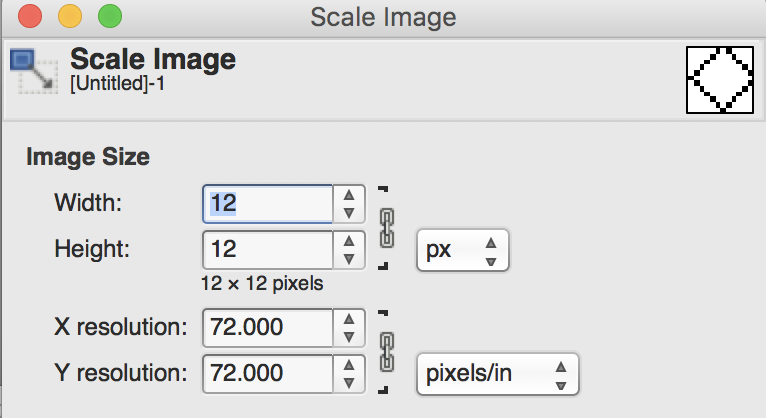 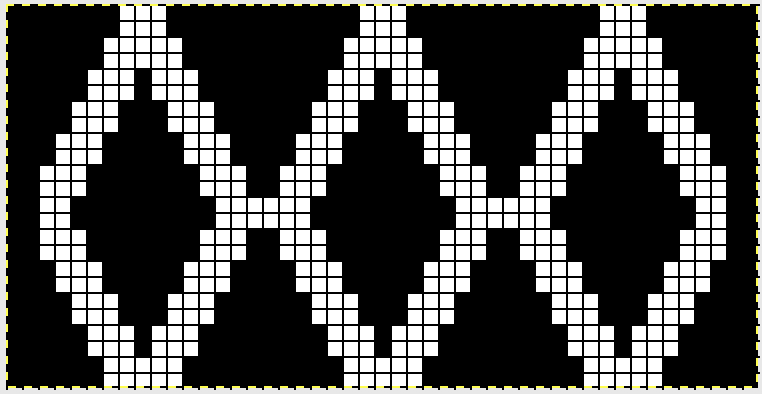 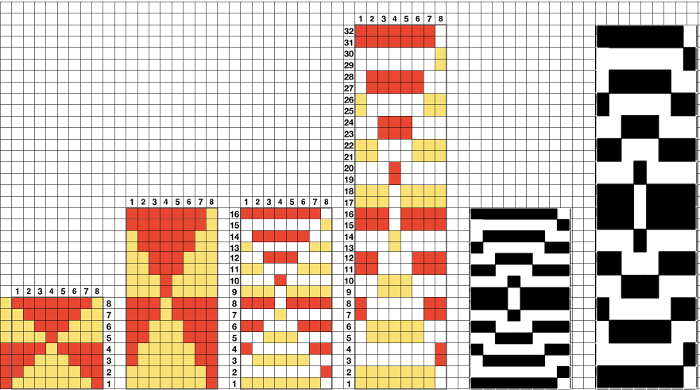 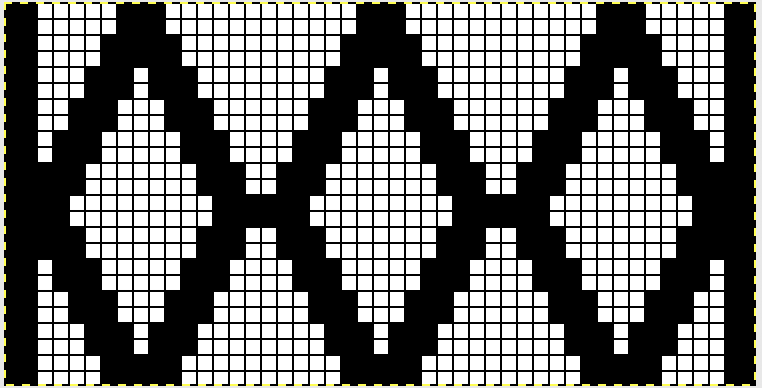 If the pattern is intended to be repeated across a larger number of stitches on the machine bed than that in the chart, it is always worth tiling the image to pick up any errors (sometimes happy design features). 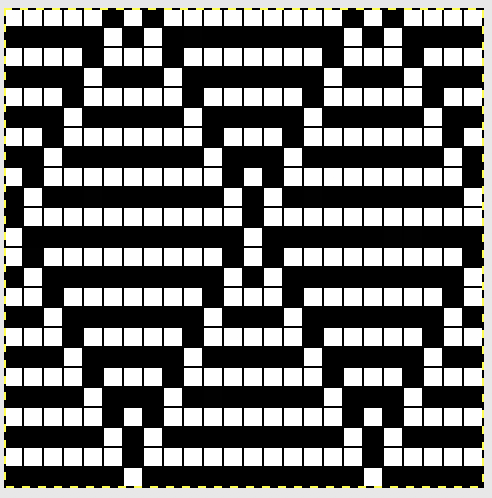 Tiling in width readily shows the error, tiling in height as well proofs row intersections as well tiling the corrected width repeat, now 42 stitches wide by 72 rows high I sometimes tend not to keep immediate notes when I test ideas, which often comes with a price. 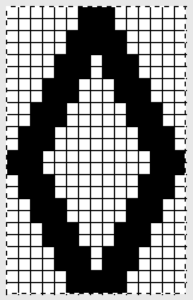 I knit my first swatch using this repeat beginning the pattern with 2 rows of tuck, resulting in this fabric (and some randomly dropped stitches once more) with the same color diamond on both sides: Beginning the pattern with 2 rows of slip stitch on the main bed only mirrors the swatch at the start of this post. 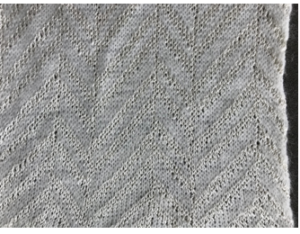 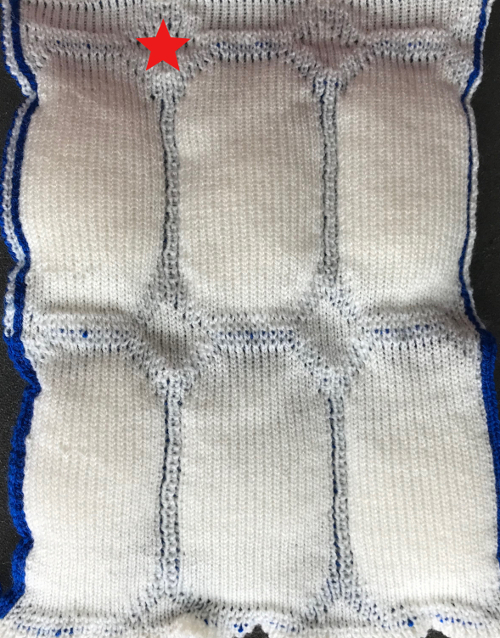 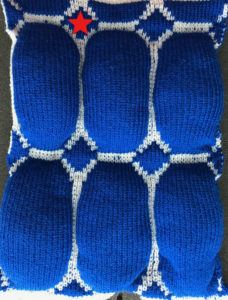 Where no needles are selected on the main bed, with passes of the combined carriages, two rows of tuck will now be produced, resulting in the wider geometric shapes and the increased bleed through The tuck loops created by the white in this instance have the elongated slip stitches in the alternate color (blue) partially covering them, creating the darker geometric shape in the top detail photo. 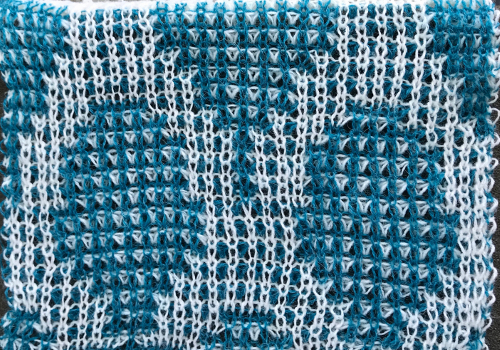 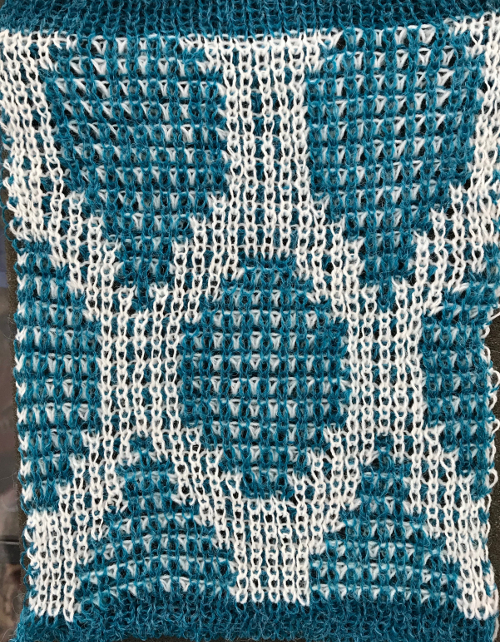 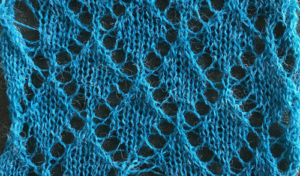 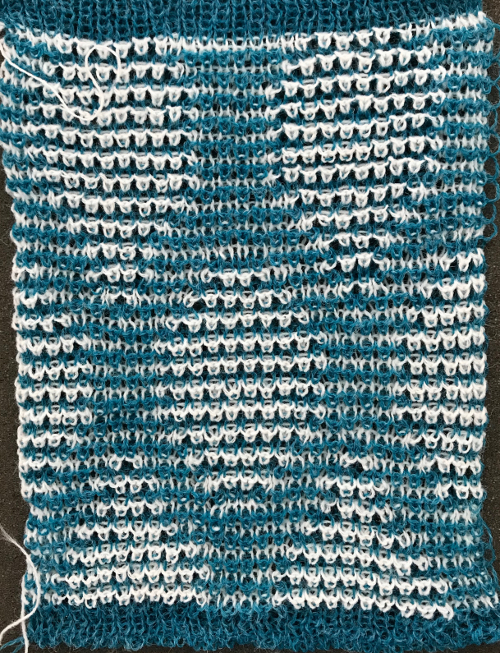 The blue is thinner than the white, the effect will vary depending on yarn weight and tension used for the main bed yarn. 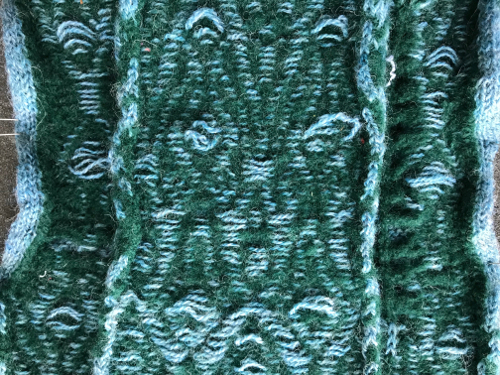 One can begin to observe the change in width in areas with more stitches tucking. 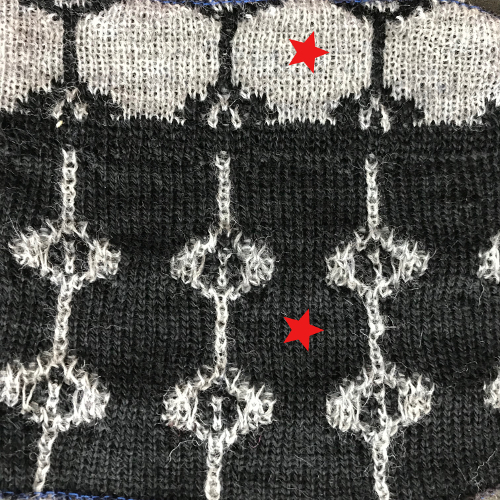 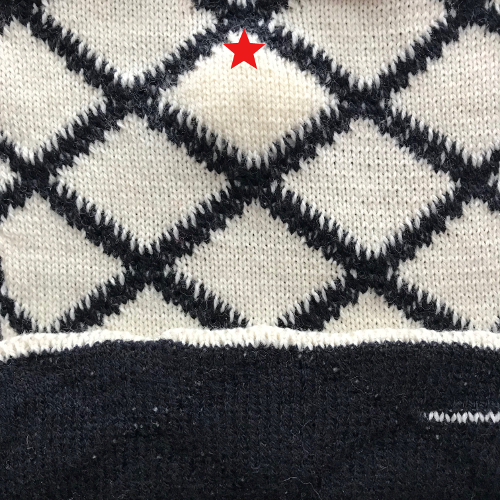 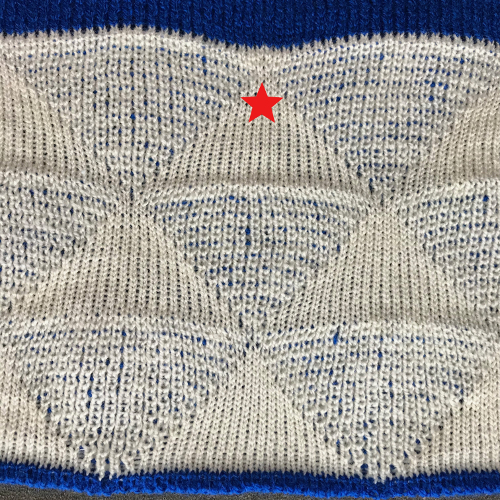 If the aim is to have a tighter, more clearly defined diamond, after the swatches rested, the swatch that began in slip stitch setting appeared to “work” better to my eye, even with the single color geometric shape on both sides taken into account. 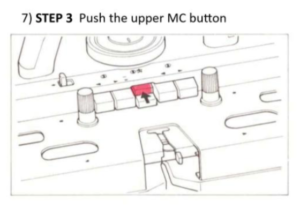 Ultimately the choice is a personal one. 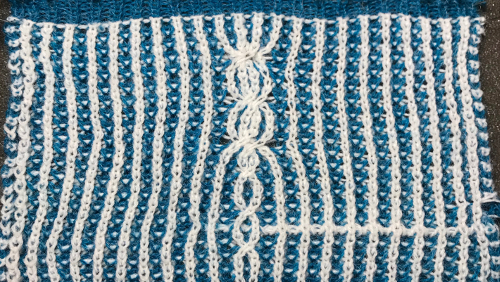 The wider vertical stripes created in the white yarn in the slip combination fabric happen because of the 2 stitch wide repeat on the top bed as opposed to a single needle one in a true fisherman knit. 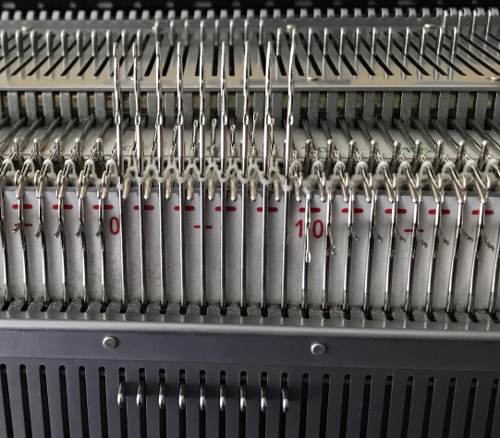 Because of the slip setting the results will be narrower in width from it as well. 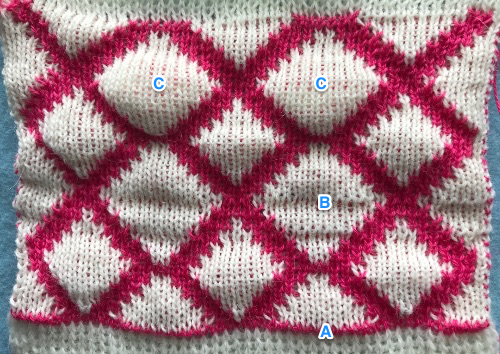 Ayab knitters will need to program any repeat across the width of the intended number of stitches, and use the single setting. 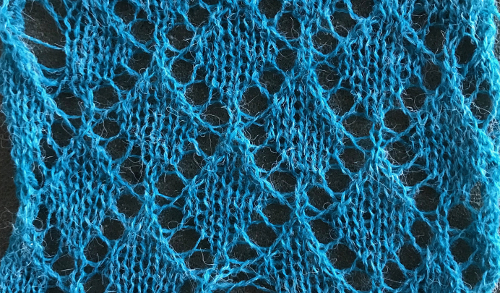 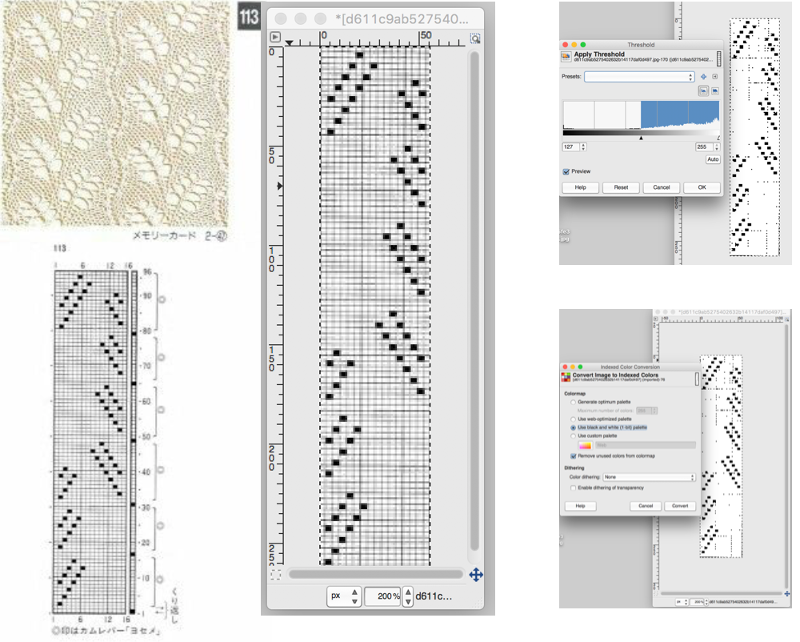 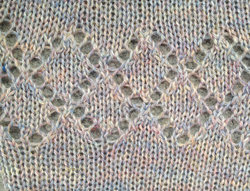 Electronic knitters can enlarge the background pattern field easily, or create brickwork, extended repeats. 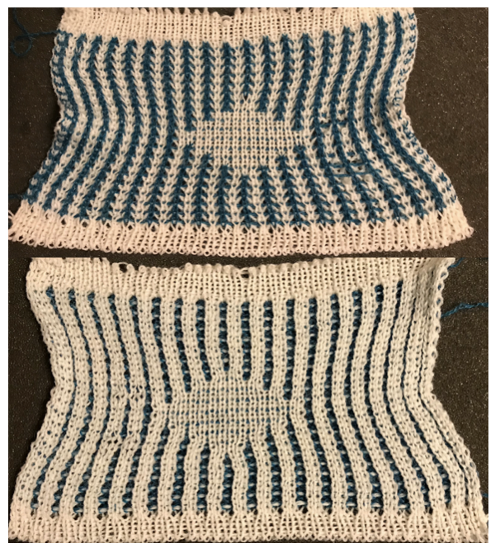 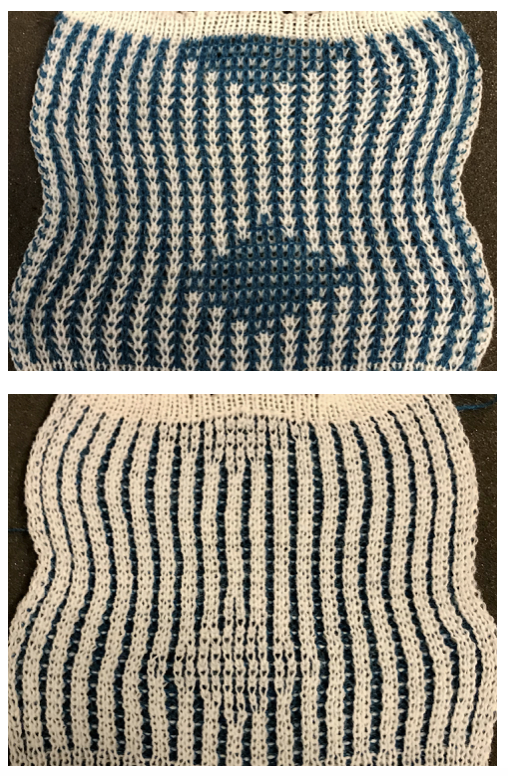 A previous post shares information on gauge swatches and testing yarn for them. 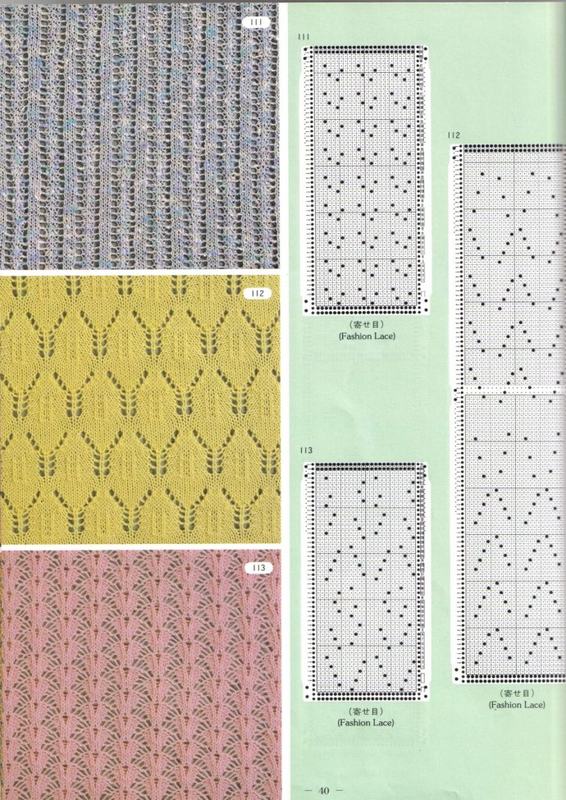 These are random FI samples from my collection, most from my teaching days. 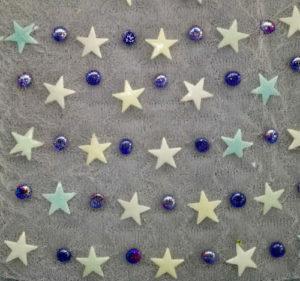 None of them were ever intended for use in finished product. 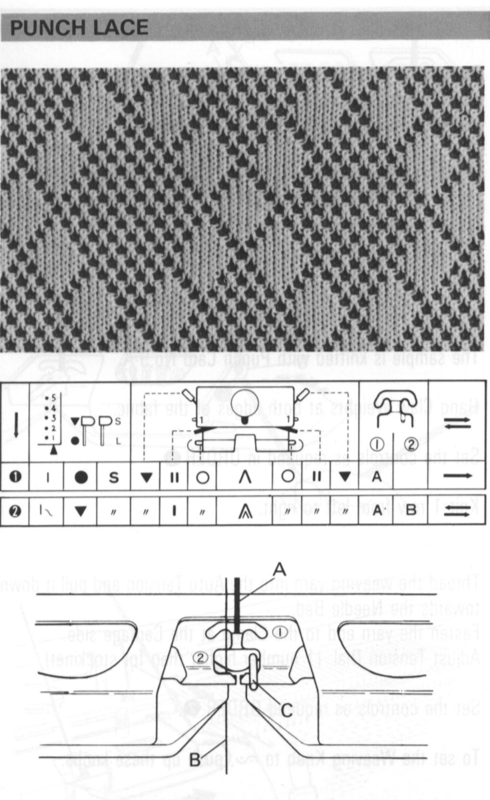 They were knit to illustrate some of the possibilities for the different techniques using each of the cam button combinations. 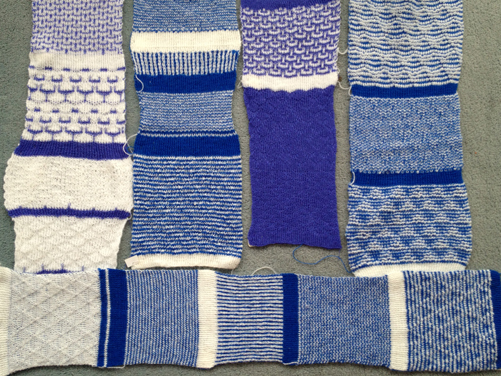 Some were knit during class demos. 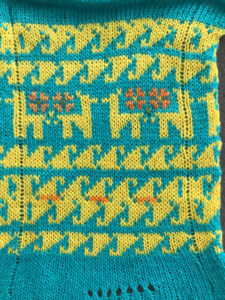 The colors made them easily identifiable as mine, from a personal yarn stash. 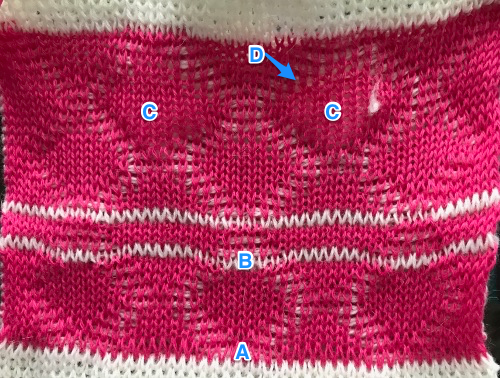 The contrast helped identify how stitches were formed, the lack of helped evaluate some of the results from that as well. 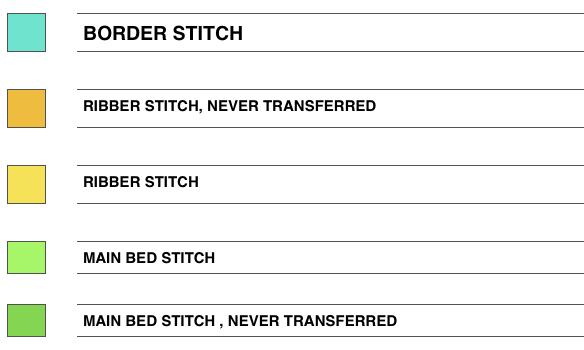 In the first swatch, marking for measuring stitches per inch is done by leaving a needle out of work. 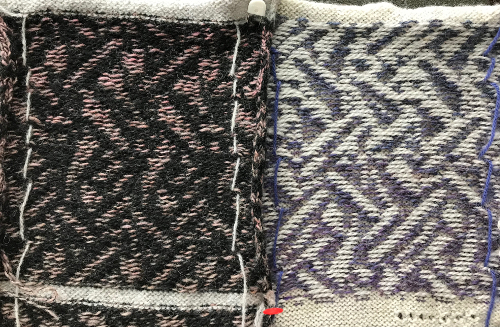 Width between resulting ladders should be checked at various points after the swatch is treated in the way you plan to treat (block) the finished fabric. 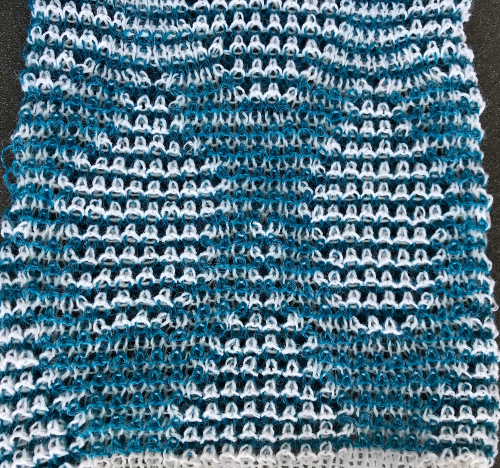 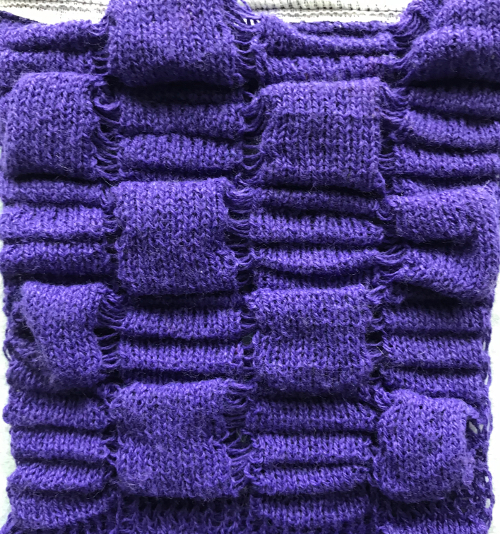 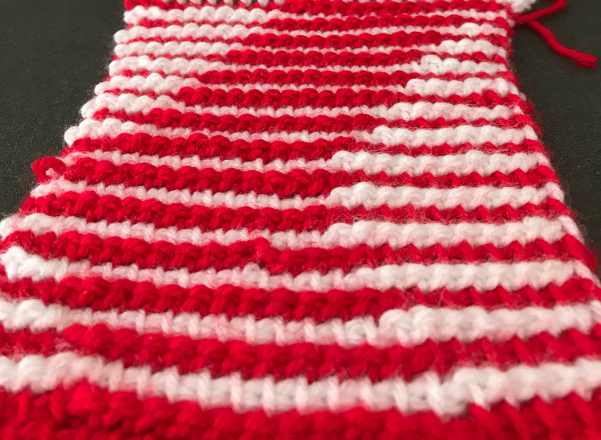 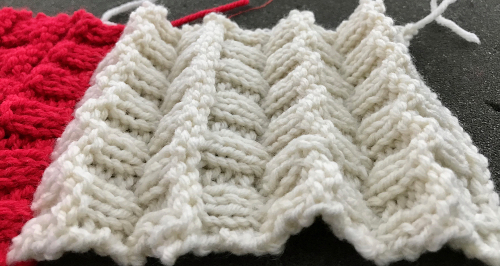 Adding a third color per row would require altering the pattern to a color separated slip stitch one, or one may add that color with duplicate stitch. Spots below are colored in with permanent fabric marker. 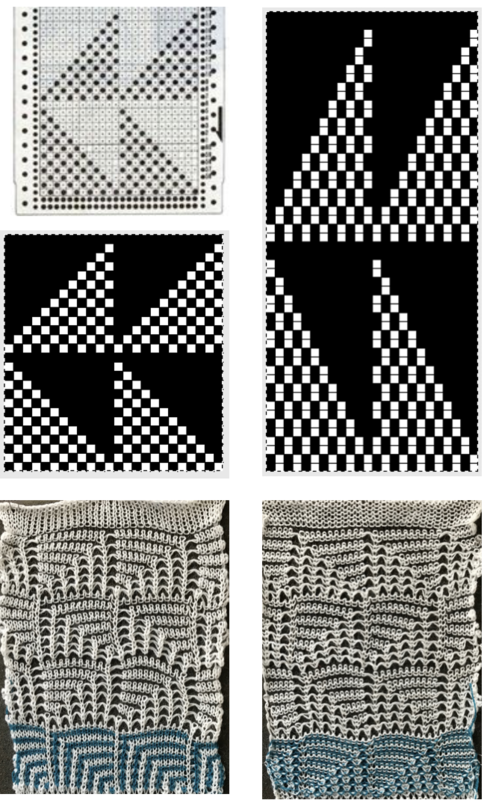 At the height of the art to wear movement one artist in particular was producing limited edition knitwear by knitting the same design in black and white, and in turn over dyeing the white for different effects in each piece in the series. 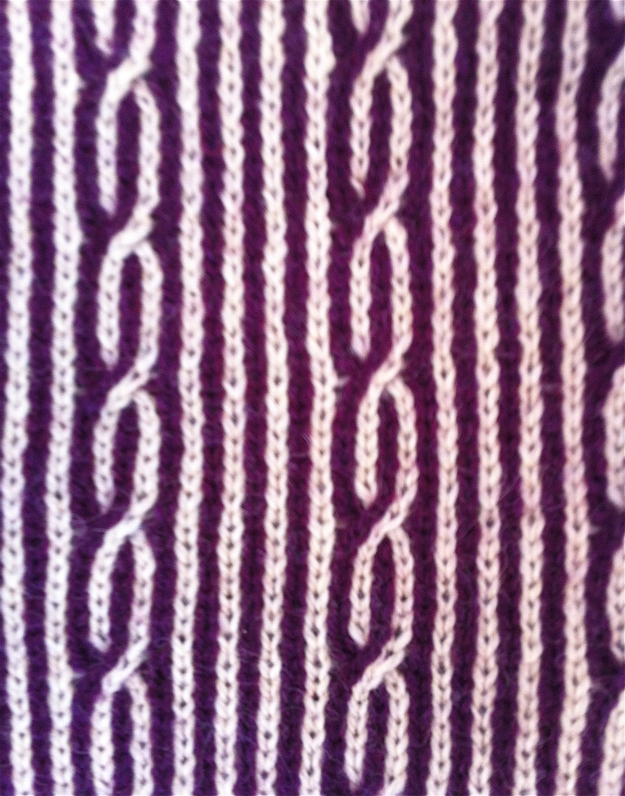 Eyelets at the bottom of the swatch are tension markings for the piece. 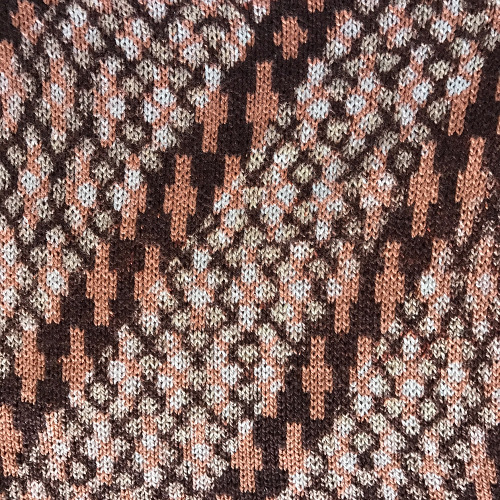 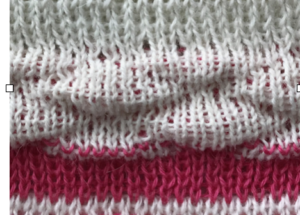 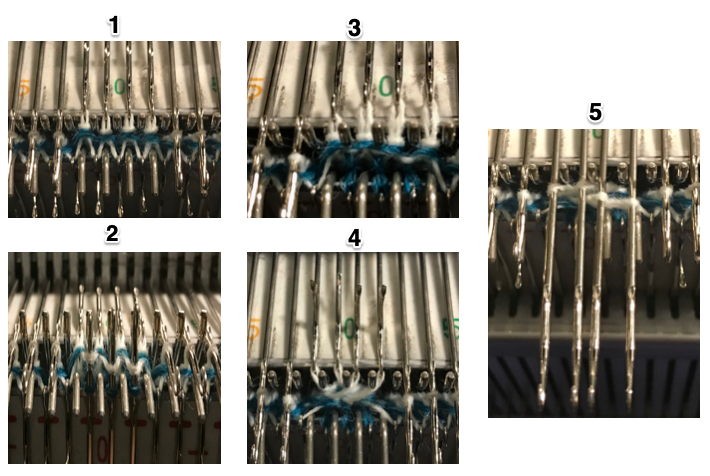 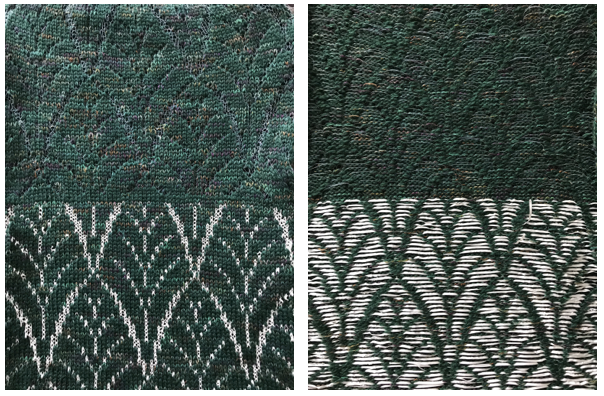 The vertical line created by end needle selection (normally used in FI to avoid separation of colors et vertical edges) is interrupted in rows that are knit in only one color. 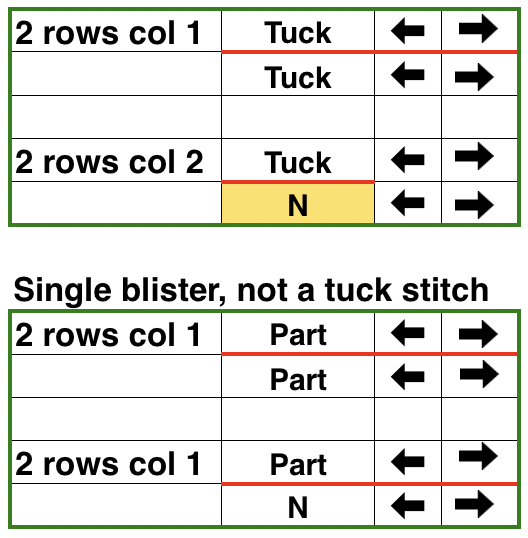 Recommended max for floats is usually 5 stitches. 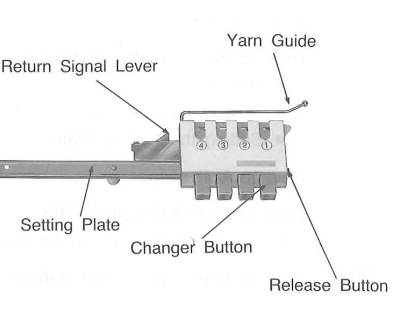 How much the floats droop and cause potential “problems” on the purl side depend on fiber content. 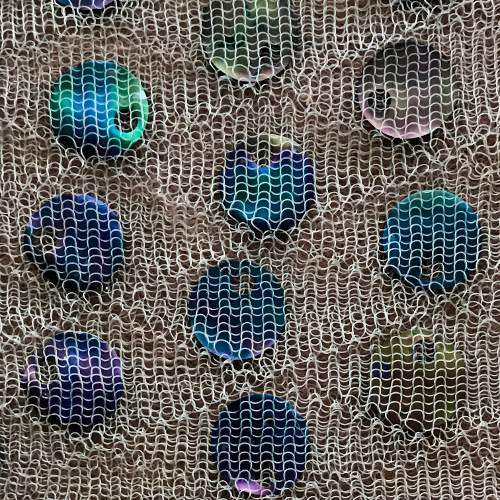 Sometimes such floats are intentionally created and worn on the outside of the garment as planned design features. 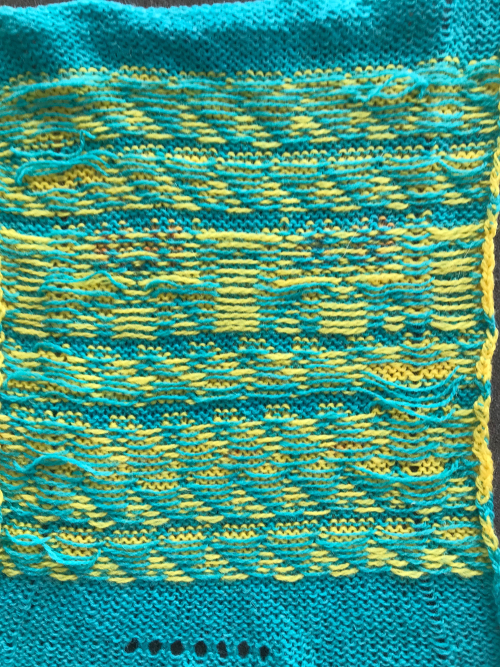 The longer blue floats are seen below in the areas of the ladders where only the yellow is knitting, creating a wider span of the alternate color. 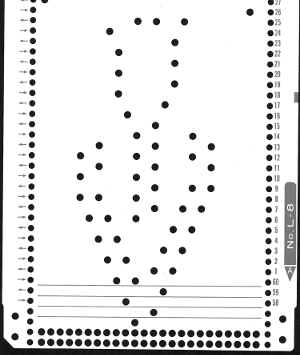 Here a factory punchcard is used. 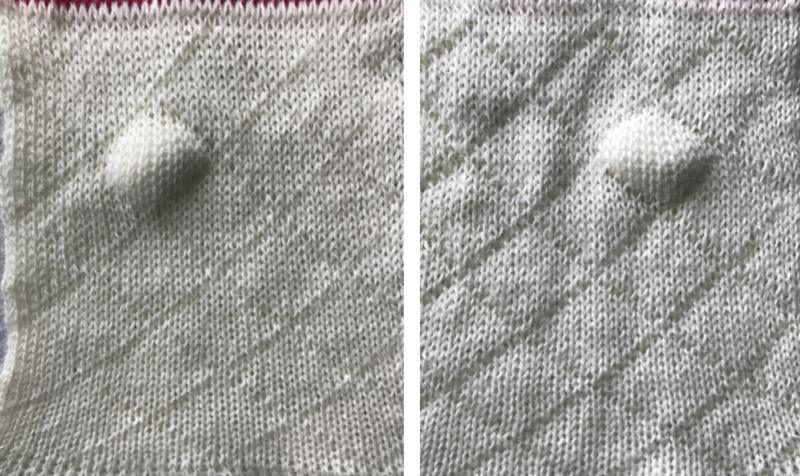 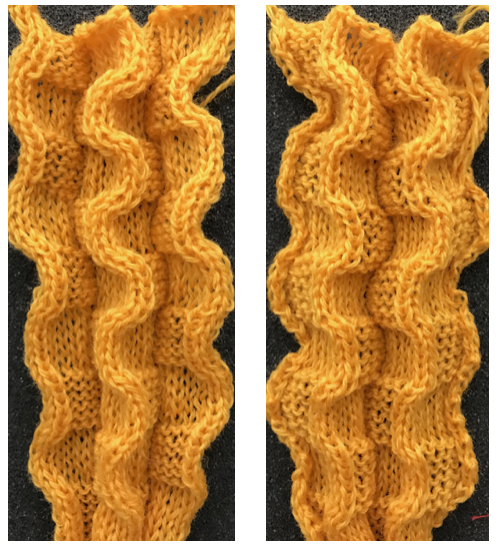 Thinner yarn in lighter colors may have some bleed through of darker colors traveling behind them, as seen on the left. 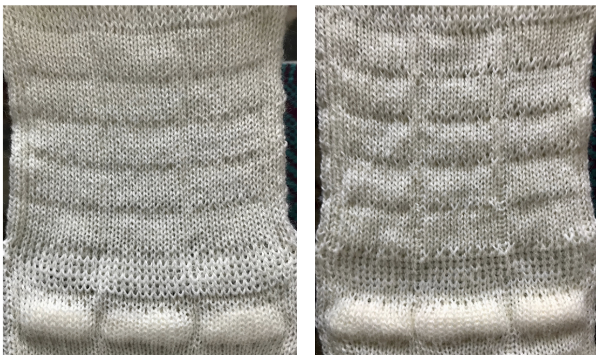 Not an issue with the thicker wool on the right. 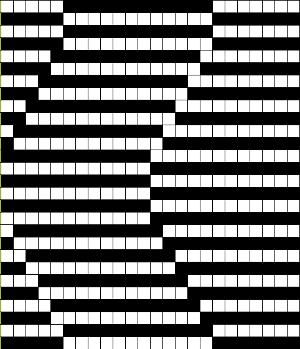 Forgetting to set the card to advance can result in vertical lines, which could alternately be planned as a design feature. 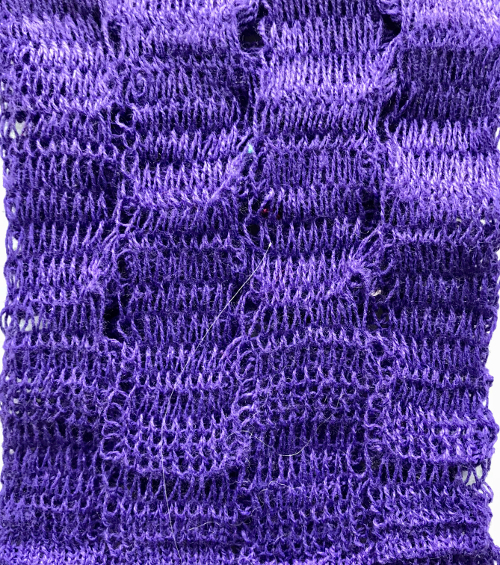 The longer floats seem manageable in these yarns, there is a bit of hooking up on the bottom right. 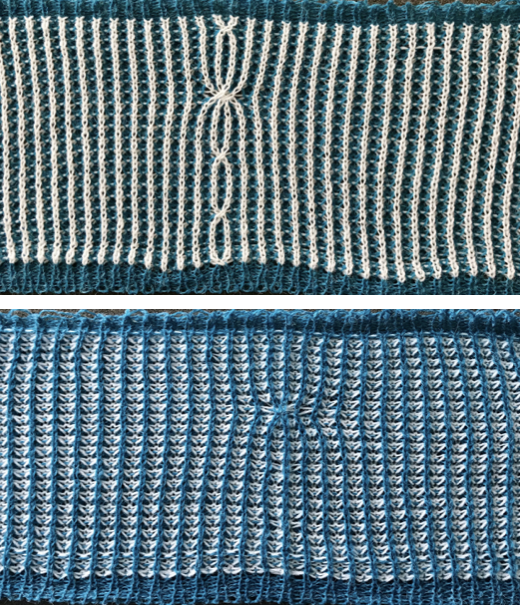 The yarn traveling up the swatch on the right is an alternative way to mark for gauge measurements. 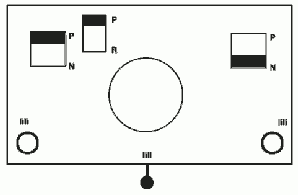 A previous post provides some information on float control. 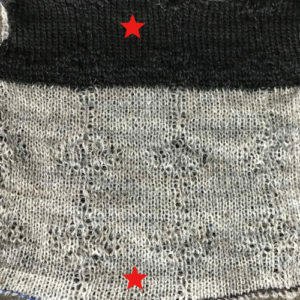 Varying the colors, fiber content, and considering complementary borders is worth exploring thoroughly at the swatch level, before committing to a larger piece. 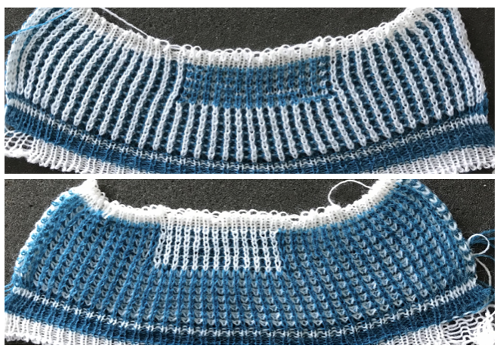 Truly contrasting yarn used at the bottom and top of the area to be measured for row gauge makes the process easier. 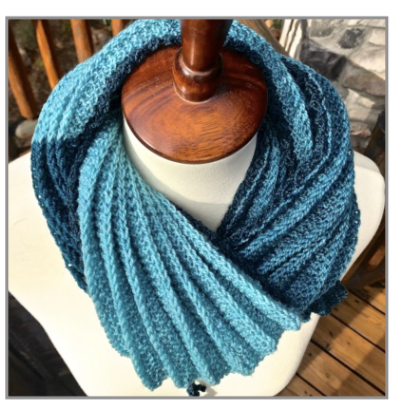 As attractive and quick as single bed FI can be, keep in mind that long pieces knit in yarns with “memory” such as wool, will tend to roll to the purl side vertically even after blocking, and certainly with wearing of pieces such as scarves or shawls.